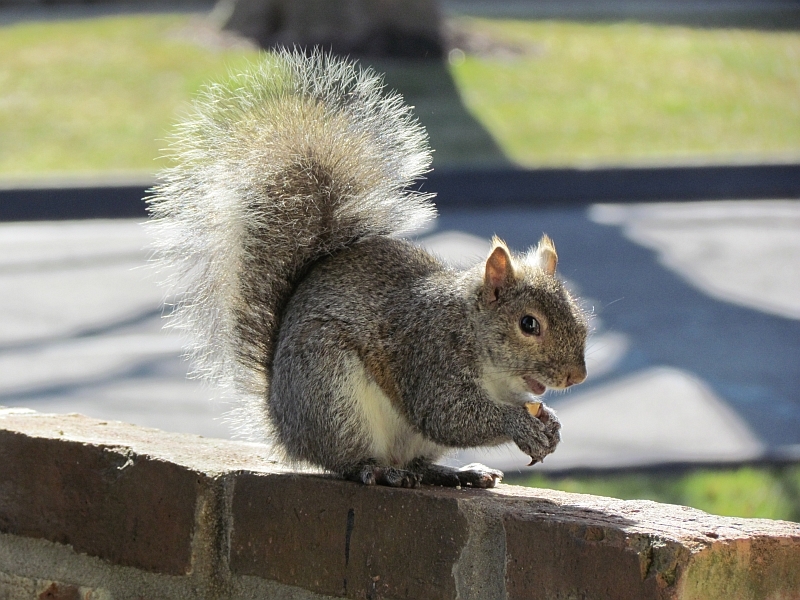 The Peanut Gallery- 2012 Review. 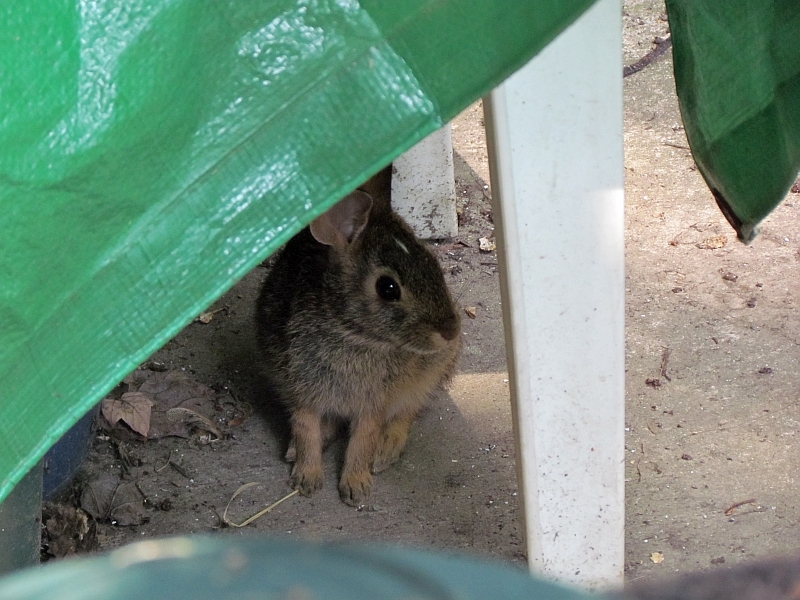 And once again it’s the annual review of what’s been going on out on the patio in front of my apartment. Where did 2012 go, anyway? That was one fast year. The blurry image on the left side of this picture is a Sharp-Shinned Hawk, one of the hawks that occasionally fly around the area. 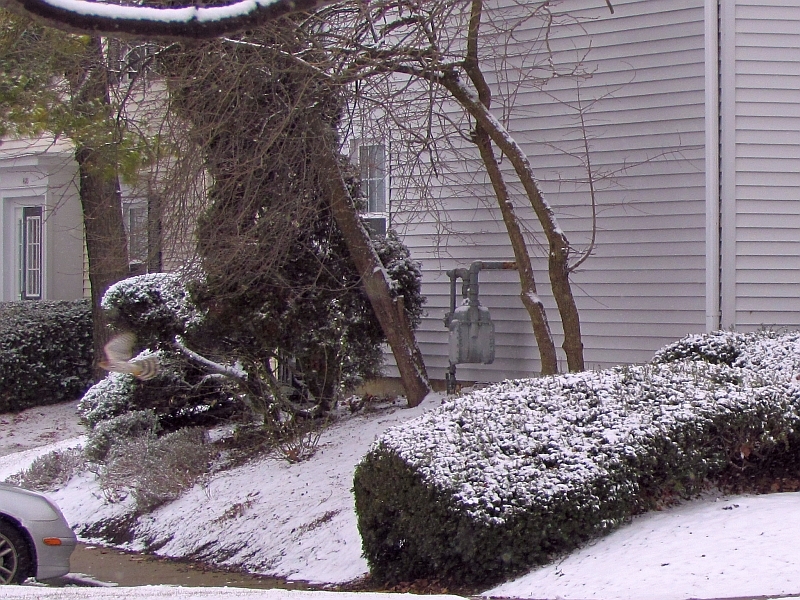 There’s a larger Cooper’s Hawk that patrols around too. One day as I was getting into my car, the Cooper’s Hawk flew over my head and flew into in a nearby tree- totally silently. 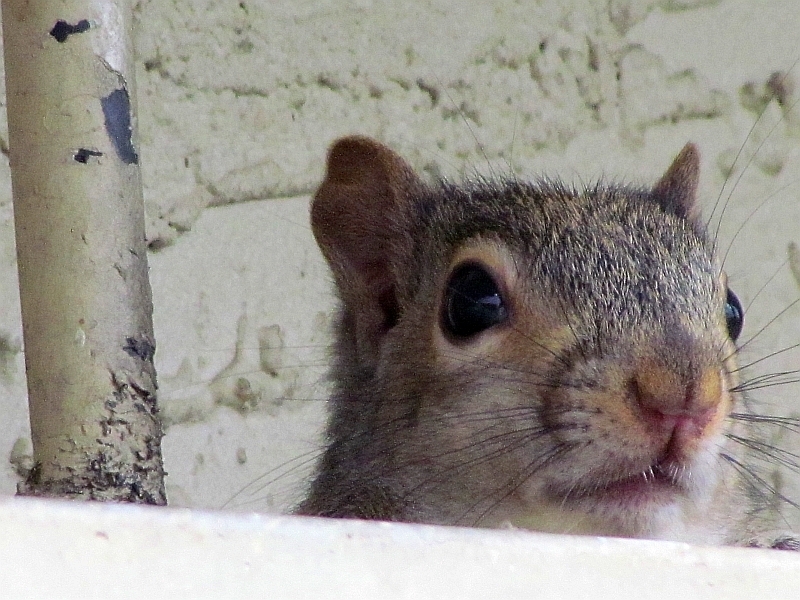 I heard no beating wings or rustling leaves. They are very good at being a surprise. 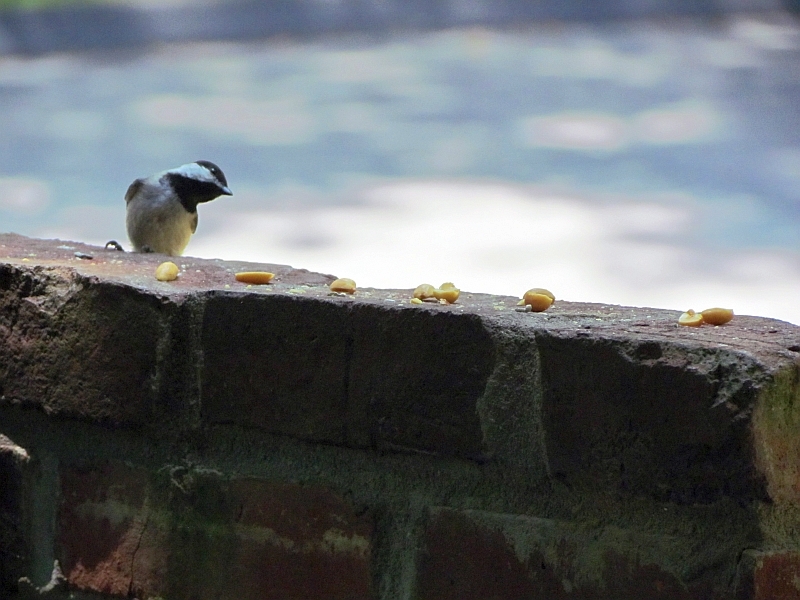 Every so often a pair of Blue Jays come by to squawk loudly for a peanut. Of course I oblige- they have me trained well. 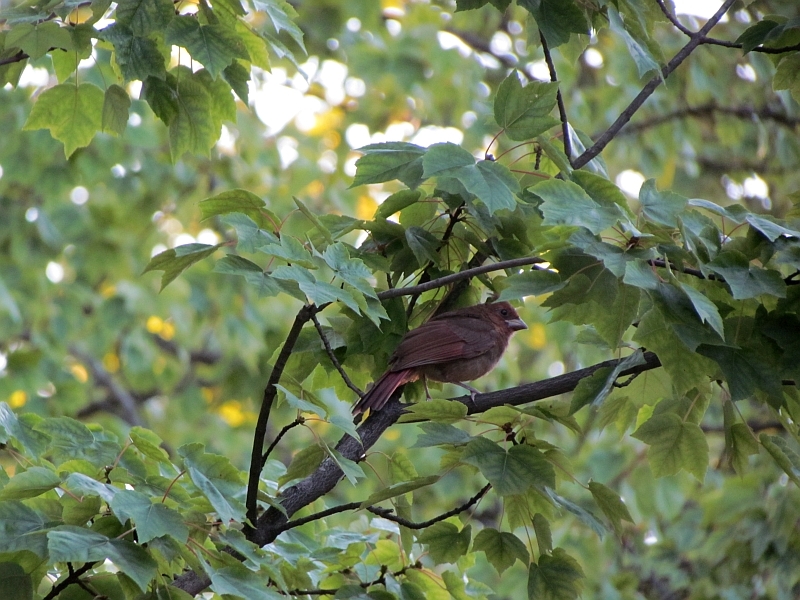 The pair of Cardinals that lives across the street kept me company from spring through the autumn once again this year. 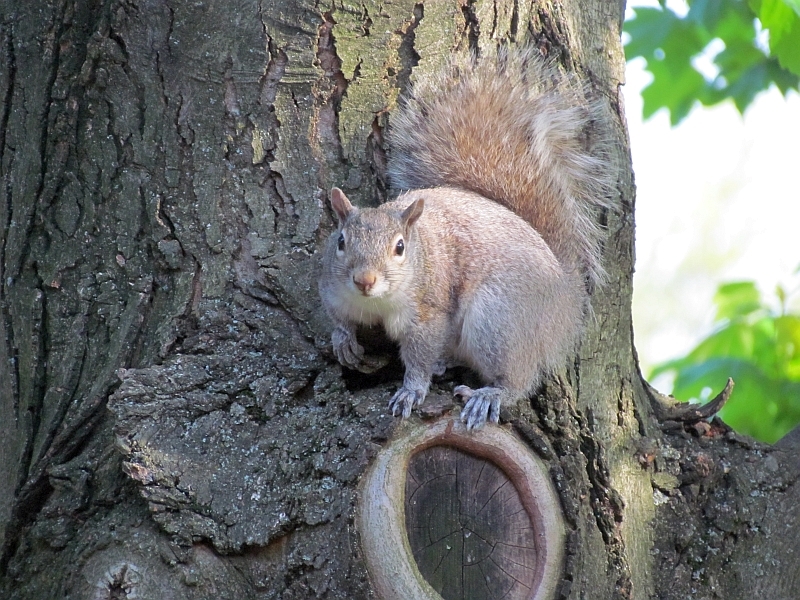 They’re like old friends now, pinging in the trees until I come out to put a few peanuts on the patio wall. 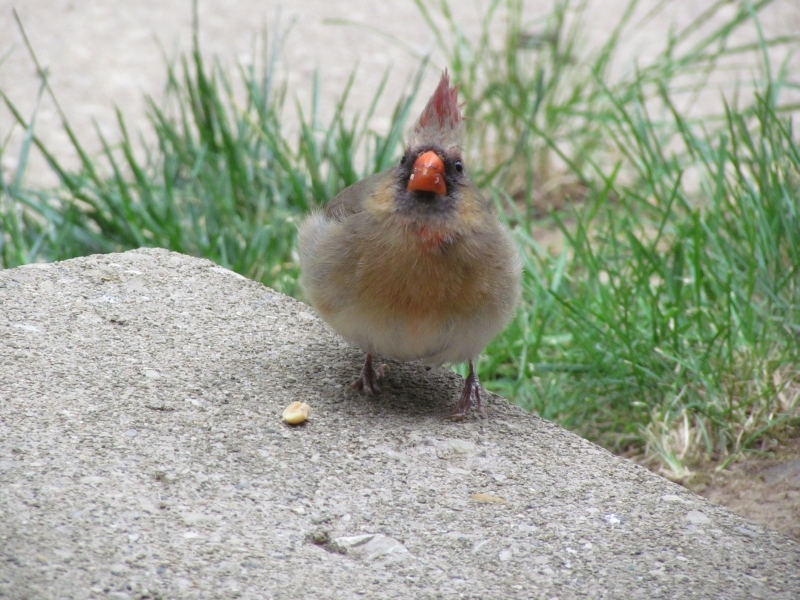 By summer, my Cardinals had raised 2 young ones. 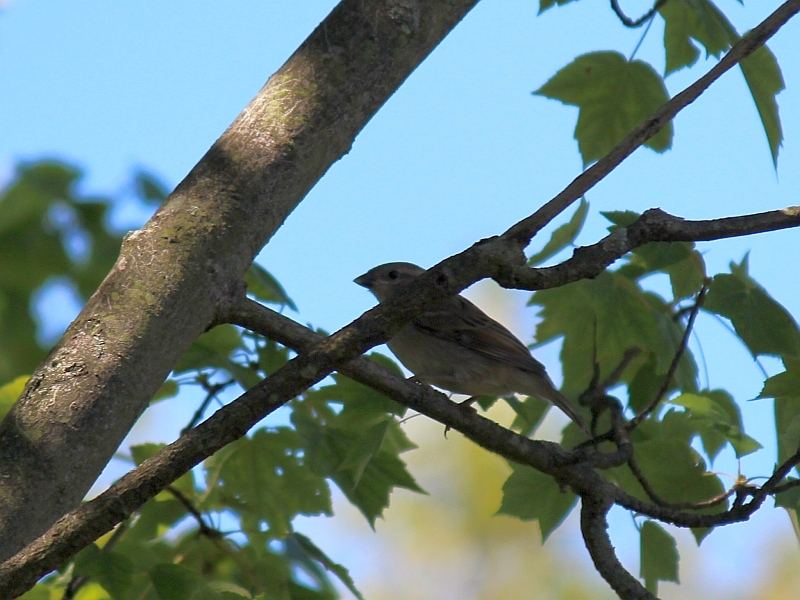 Here’s one- note the dark beak which is an indicator of a young bird. 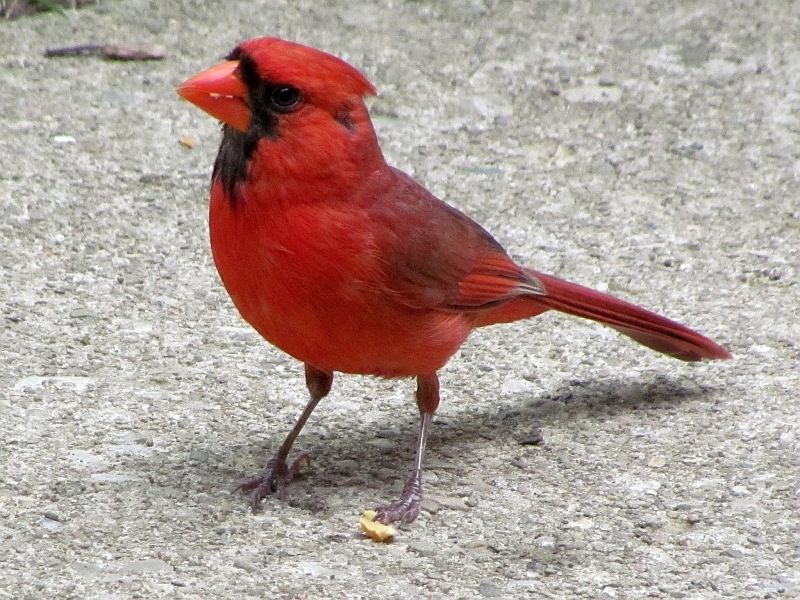 Cardinals seem quite protective of their young and feed them in the safety of trees and shrubs. This is a good thing since there are at least 2 hawks in the neighborhood. 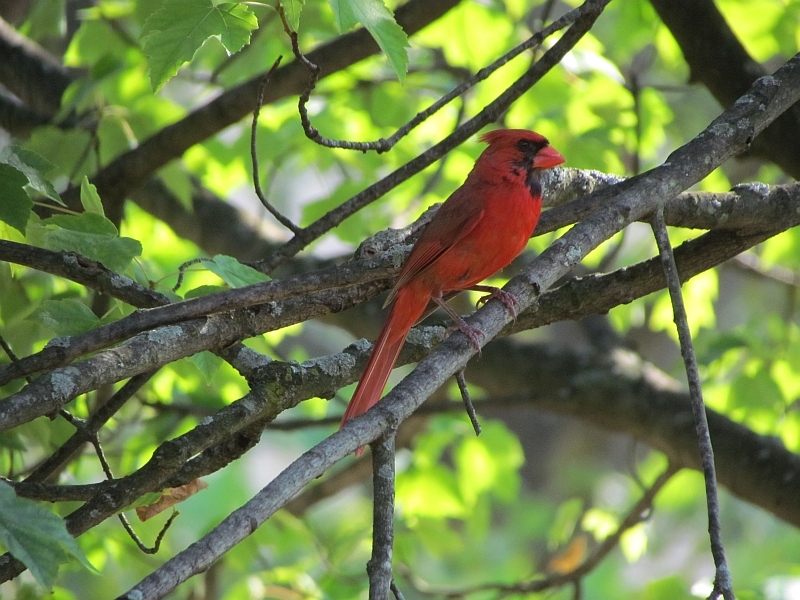 By the end of autumn the Cardinals are drifting away- they spend winters in flocks with other Cardinals. 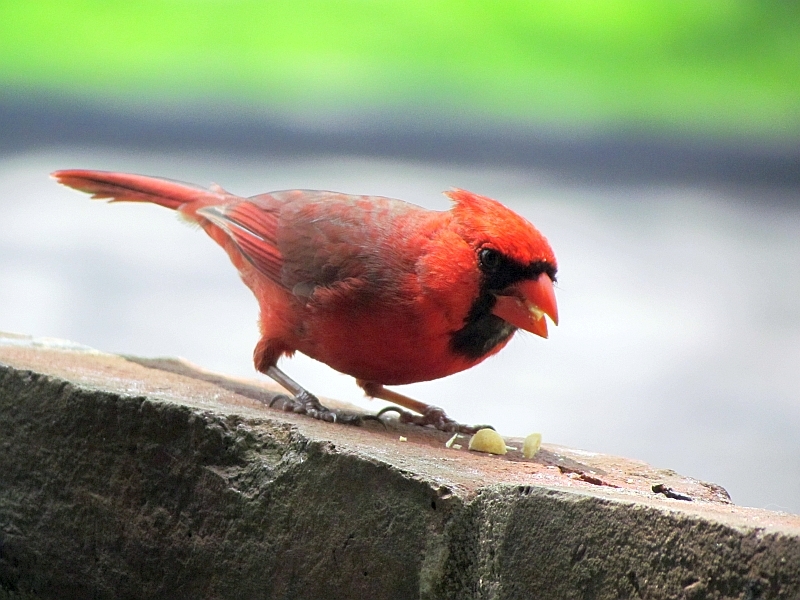 One day they stop showing up in the mornings and evenings, a few days go by, they may visit occasionally, still pinging for peanuts, but then they’re gone, in another area flocking with Cardinals that may have been their territorial rivals in warmer weather. 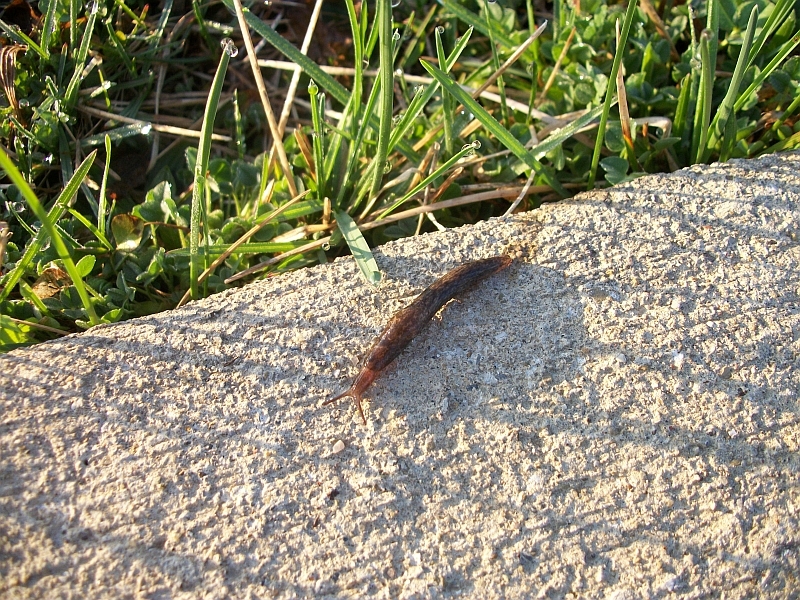 They will return next spring when they establish mating territory once more. 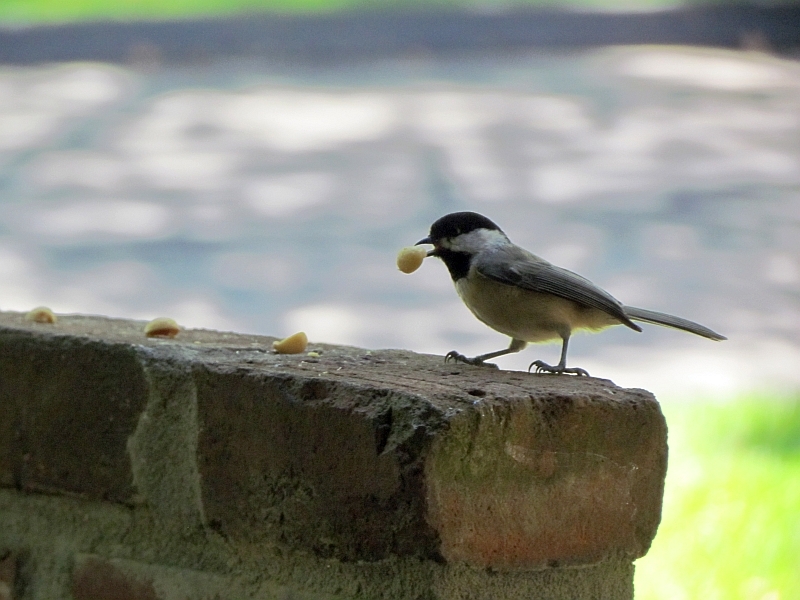 I’m convinced the pair of birds that come by for peanuts are the same pair from the last 2 or 3 years. 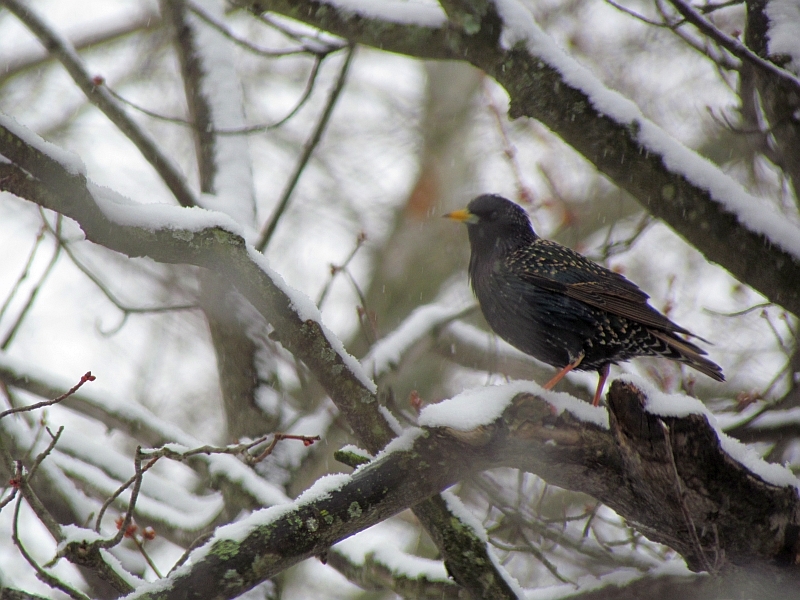 The first year is the toughest in the wild, if a bird makes it through its first year, it has a good shot at living for years afterwards. 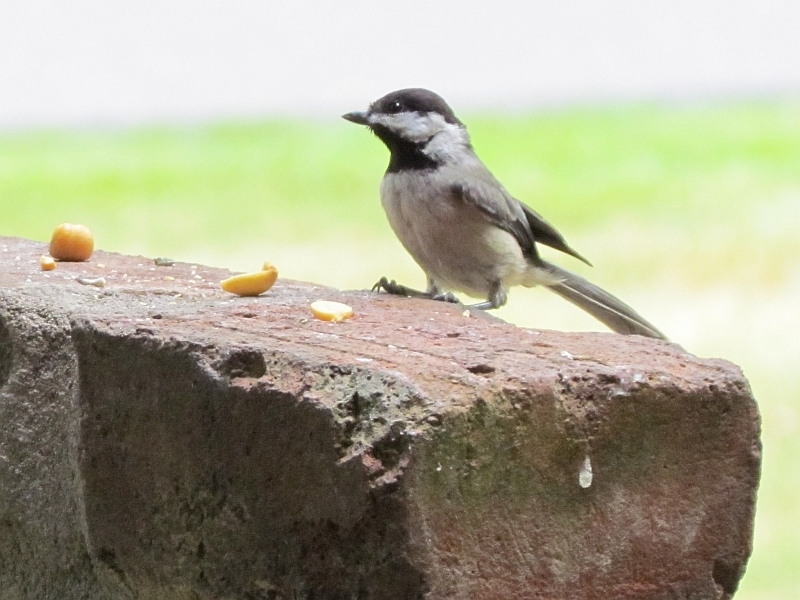 A pair of Carolina Chickadees visit me all year for peanuts. 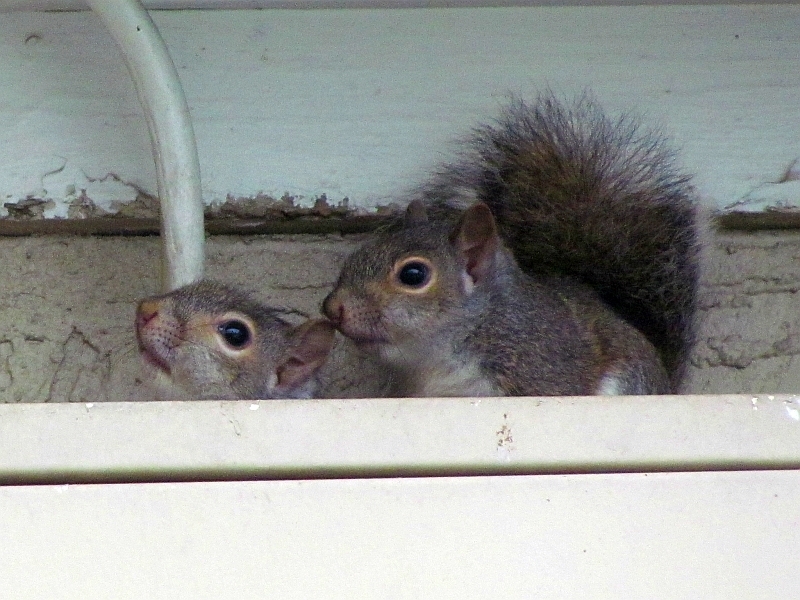 A 3rd one joined them in the summer- most likely a young one that they raised. I still see all 3 of them together now. Which peanut to take? This is a serious choice to make! 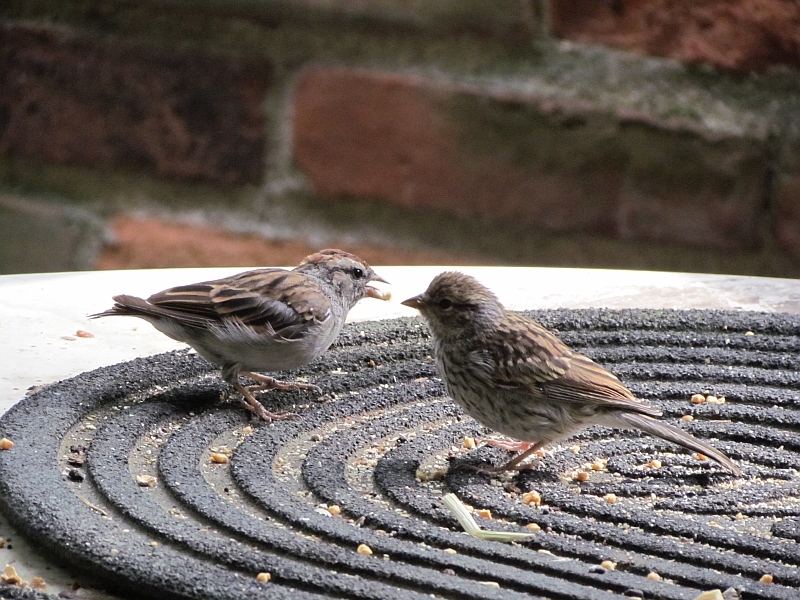 Here’s the young one getting fed. 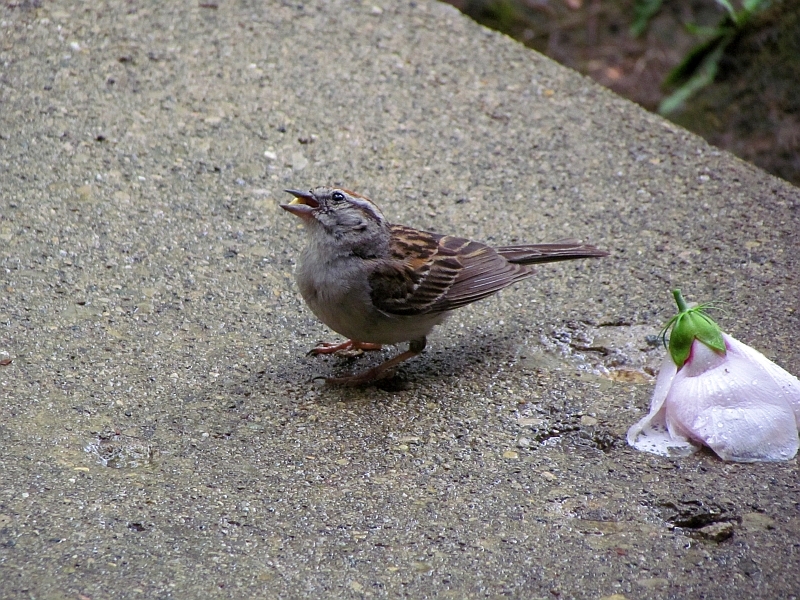 These birds make lots of fun sounds, and are quite entertaining. 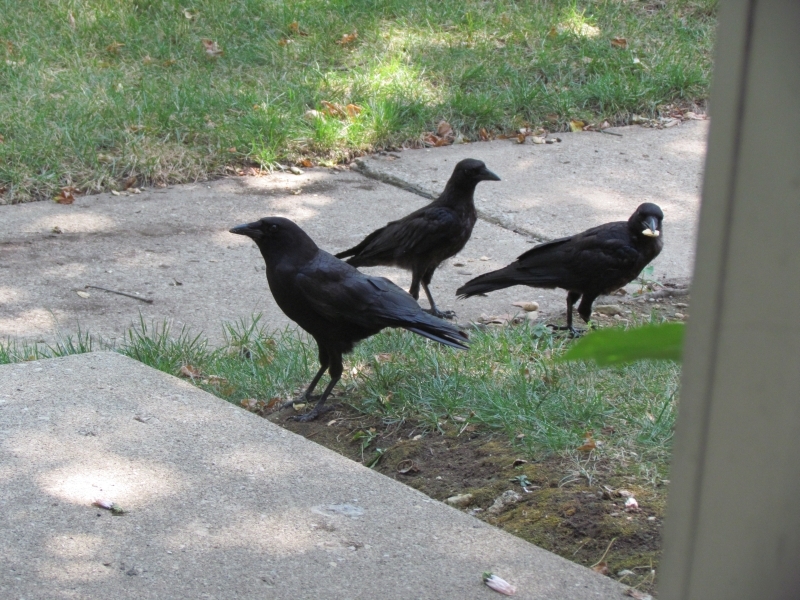 They’ve gotten pretty tame around me. 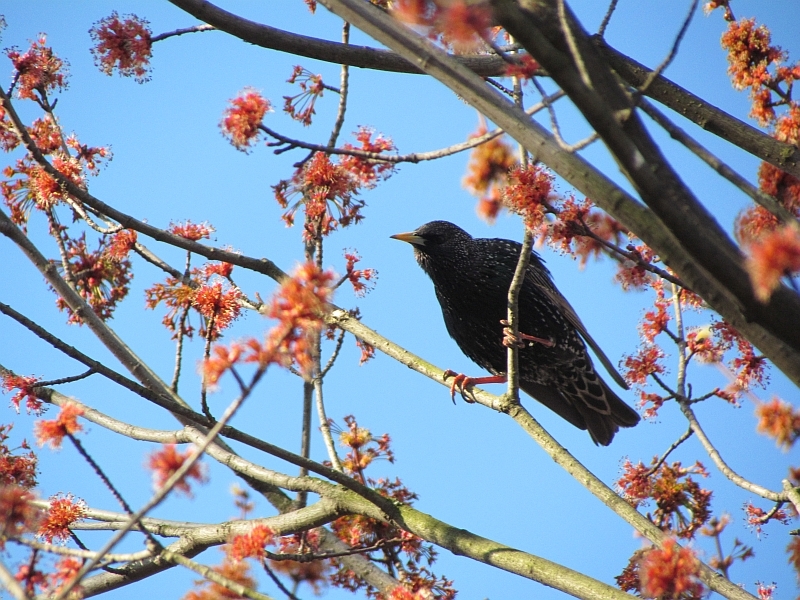 Starlings would occasionally drop by. 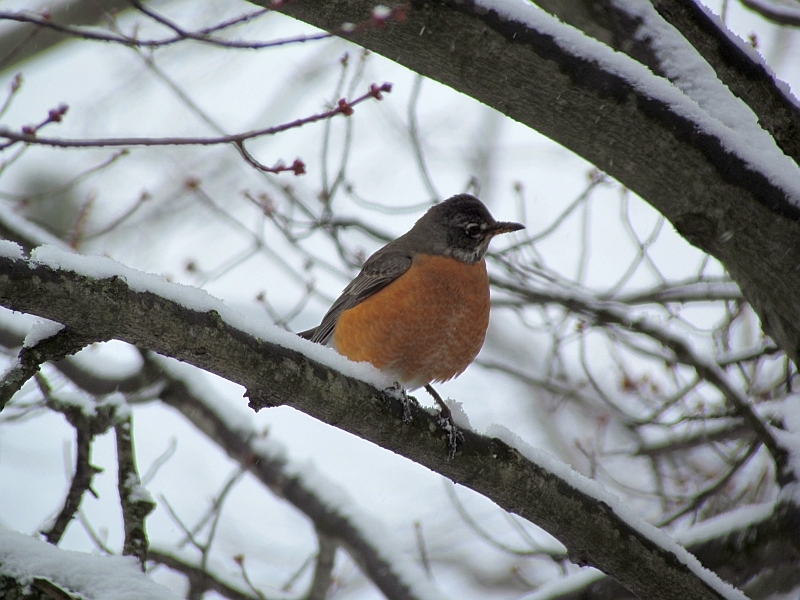 Robins are around in all seasons- they survive on berries in winter. 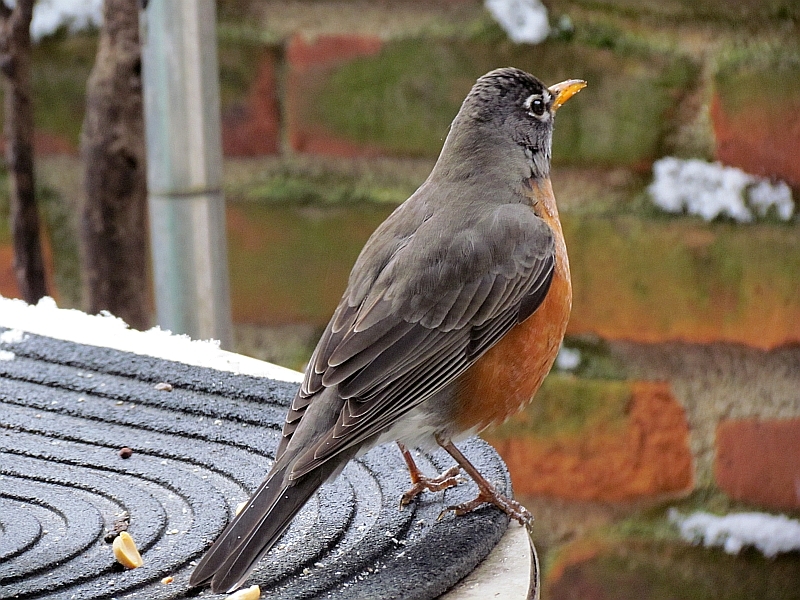 I’ll put out raisins for them in February when the berries are scarce. 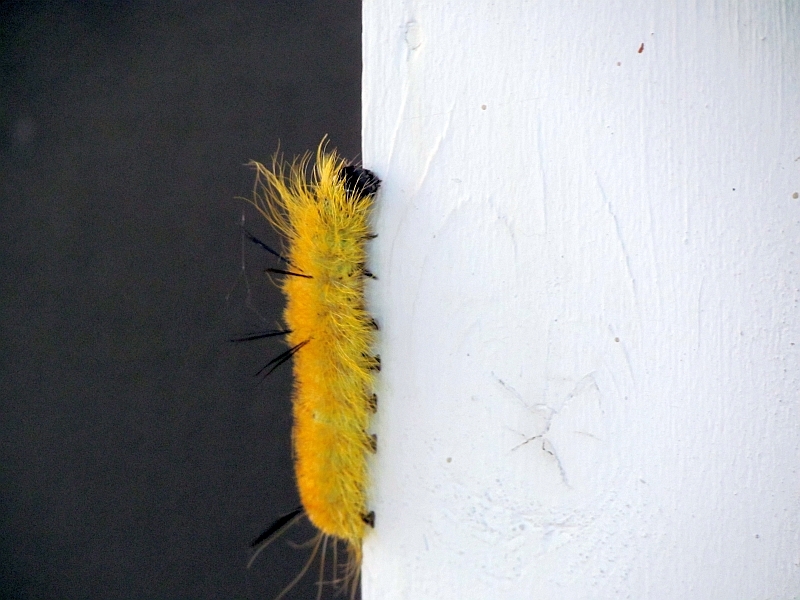 This handsome American Dagger Moth caterpillar crawled up my doorjamb. 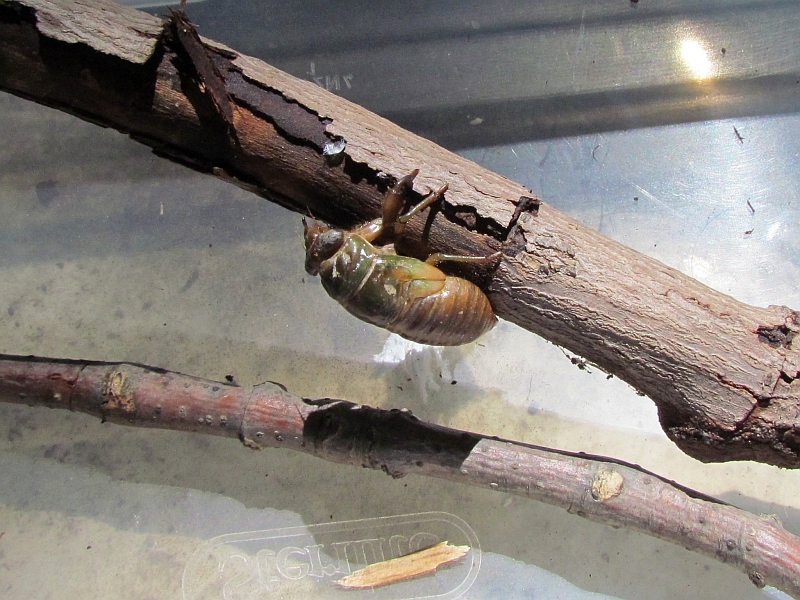 And the bug returns to the wild to buzz up a storm! 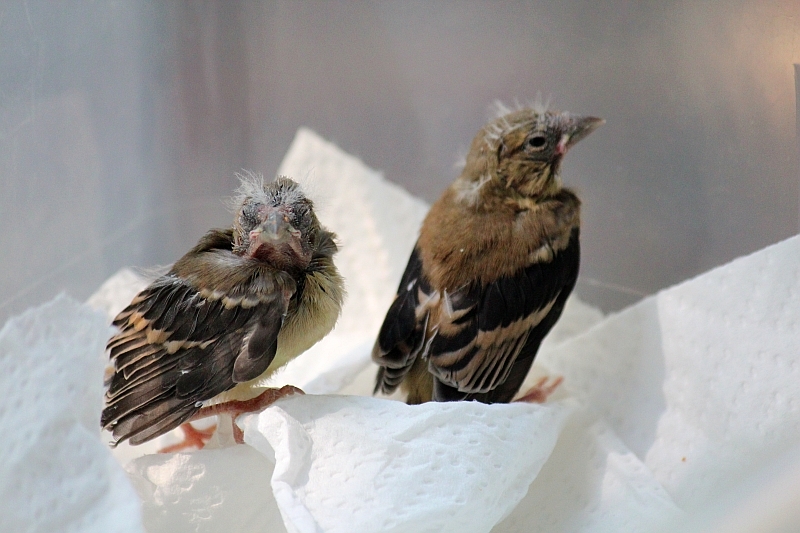 One day in the autumn, a couple of Goldfinch nestlings left their nest a little early. 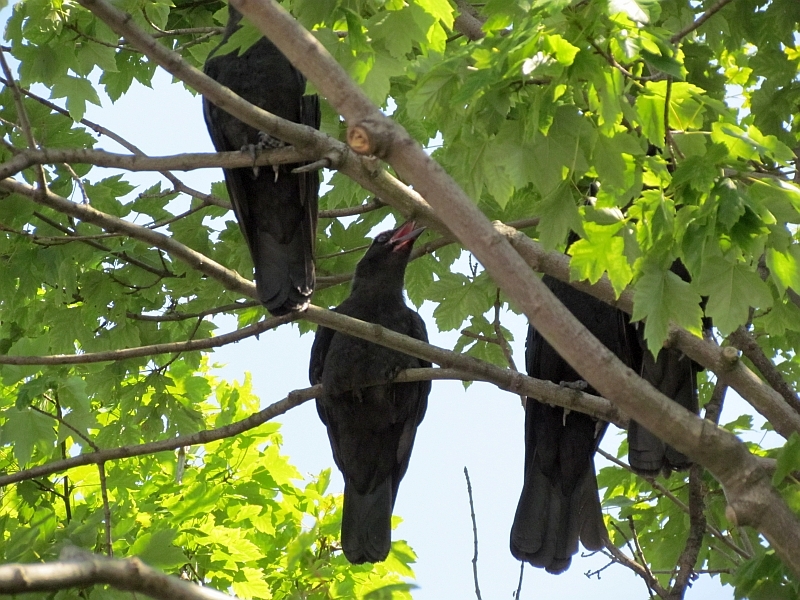 Their mother was around watching them anxiously- but a hawk perched in a nearby tree, looking for them hiding in the grass as they cheeped for their mother. Time to intervene! They went on a table on the patio- their mother was close by (that’s her above), but eventually the hawk scared her off. 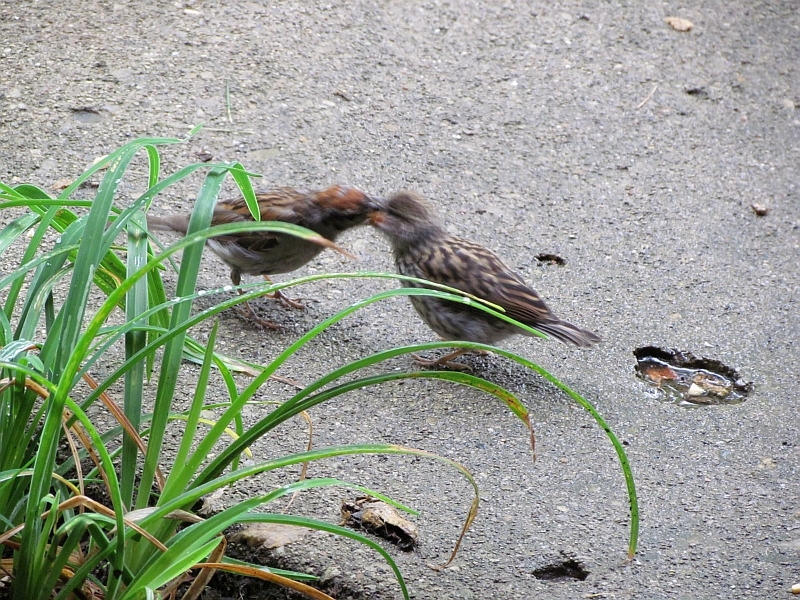 One of the nestlings was trying to eat on its own, the other was too young and was difficult to feed. So it was time to take them to the Ohio Wildlife Center, because with the hawk nearby, they wouldn’t have made it otherwise. The OWC is staffed by volunteers (donations are welcome) and they give many animals a 2nd chance at life. 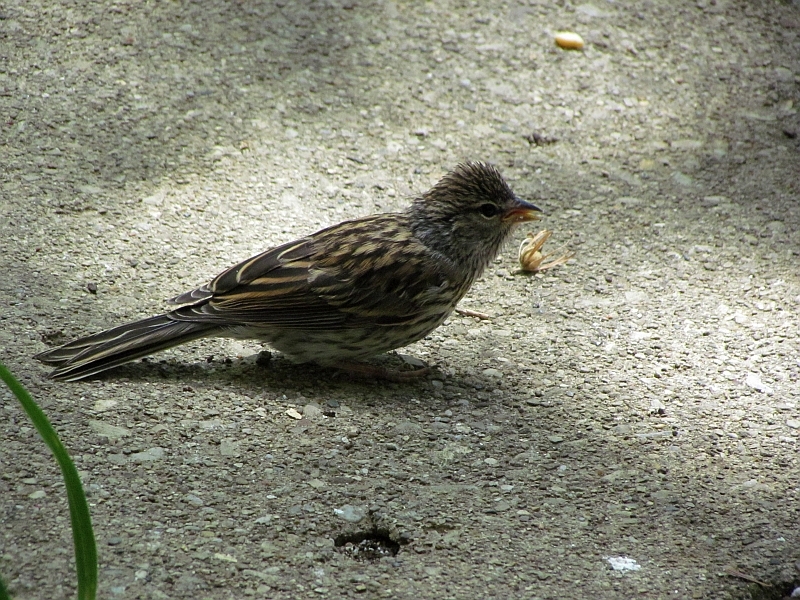 The youngest bird would cheep up a storm when the sun shone on it- it was starting to overheat, so it needed some shade. 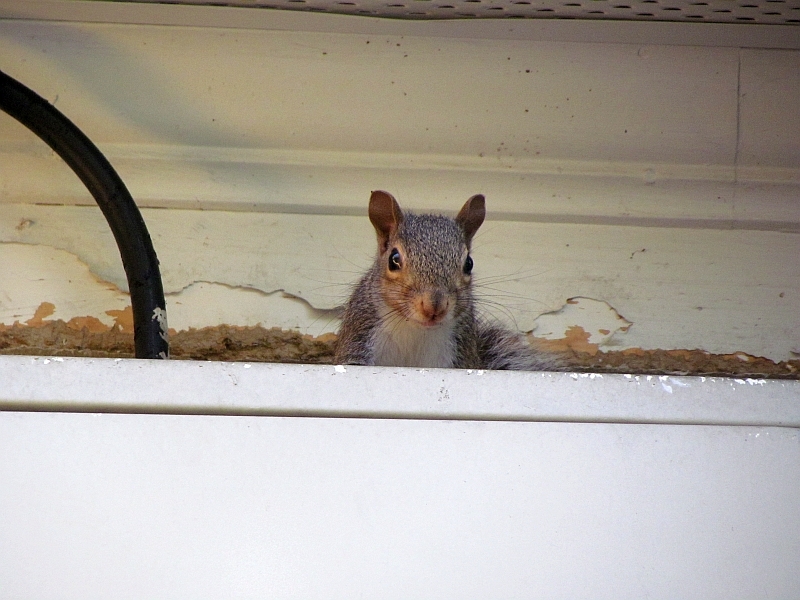 The eldest nestling was very curious. 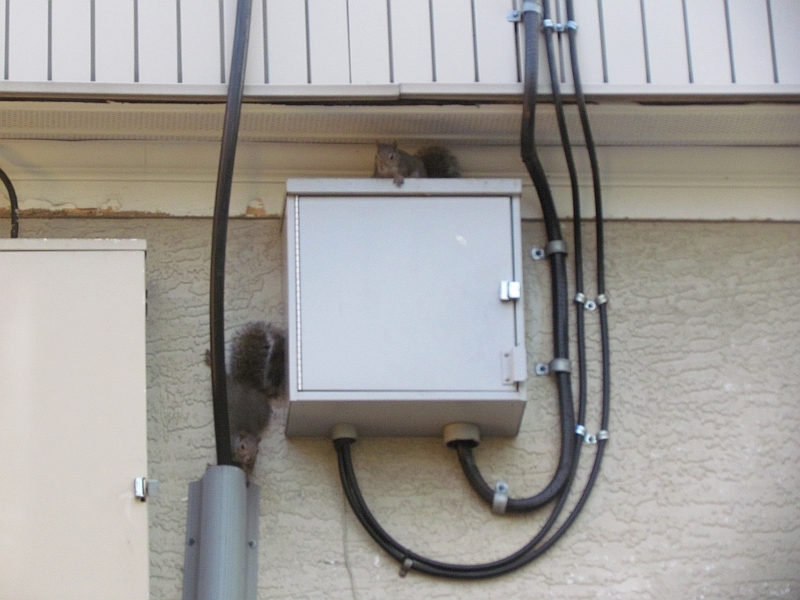 Sorry that they were separated from their mom, but the OWC will take good care of them. 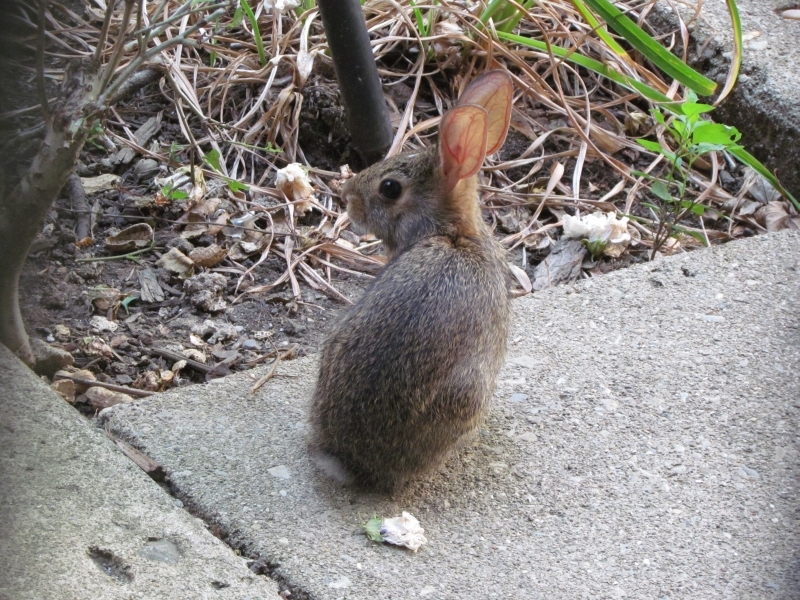 This young rabbit visited the patio in the summer- it was rather tame, but could take off like a bolt of lightning when it needed to scoot. 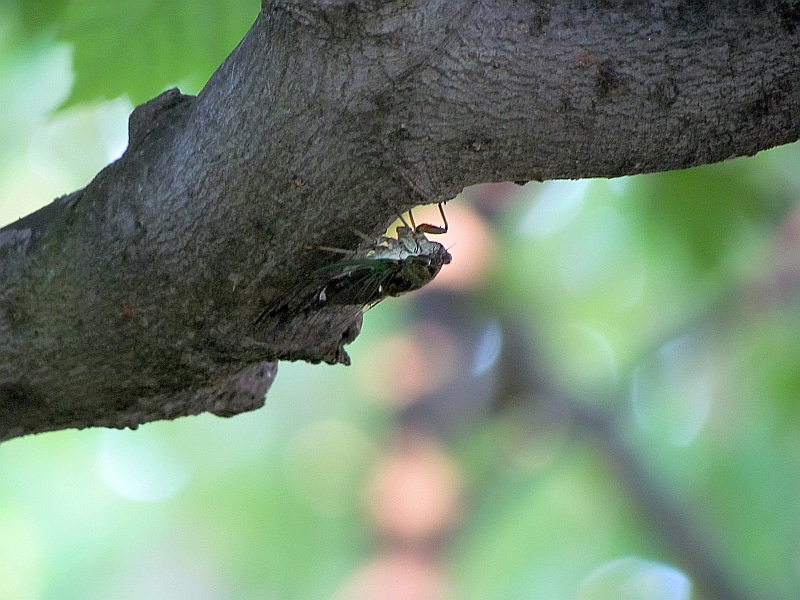 It had a narrow white blaze on its forehead. 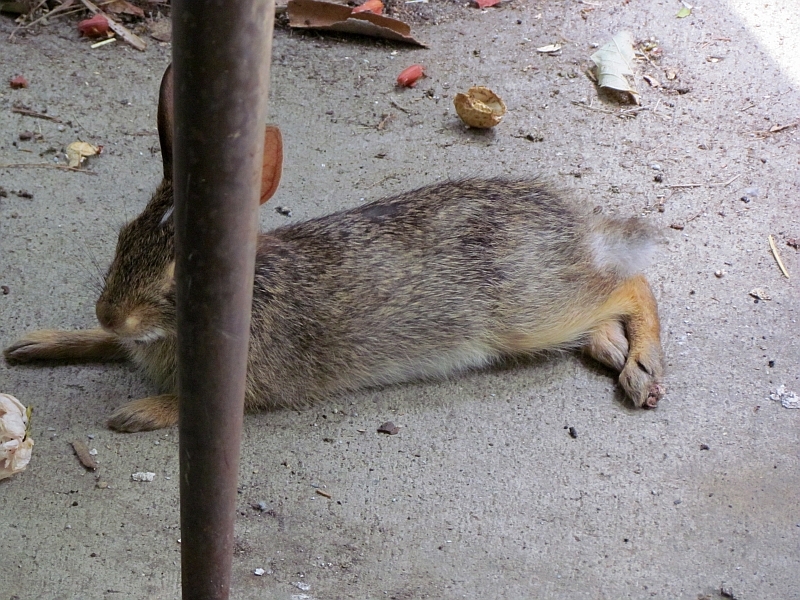 Resting to beat the heat on the cool concrete! 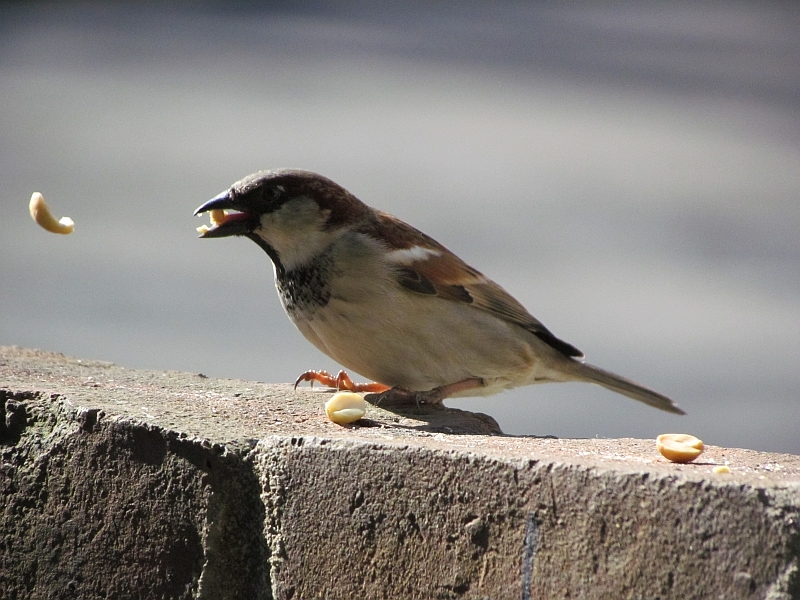 An action shot of a House Sparrow chomping a peanut. 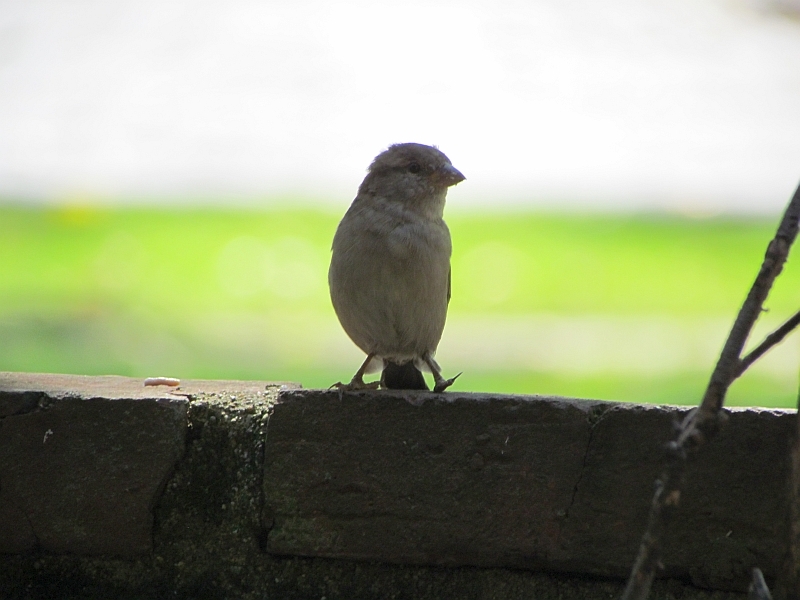 This female House Sparrow has something wrong with her left foot. She got along just fine, though. 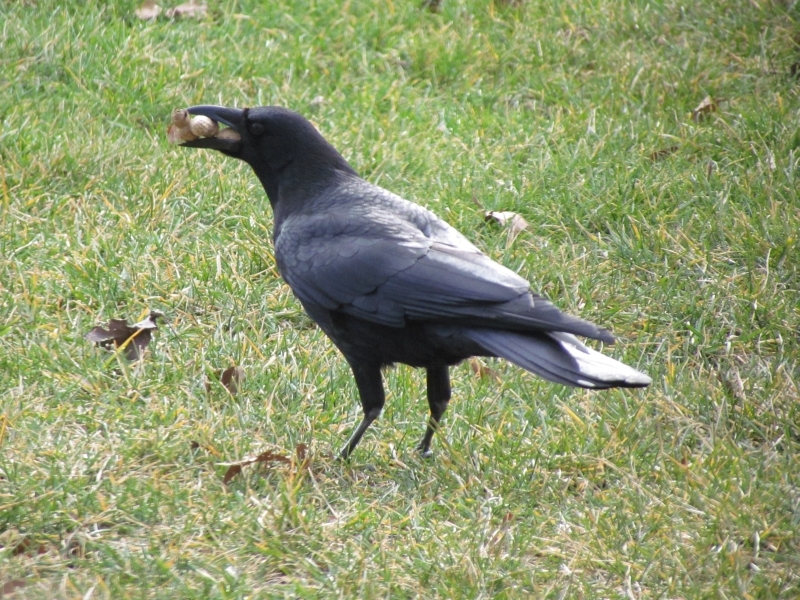 I contributed to a local Leopard Slug boom- they liked peanuts as much as birds. I’ll do a post on them someday. 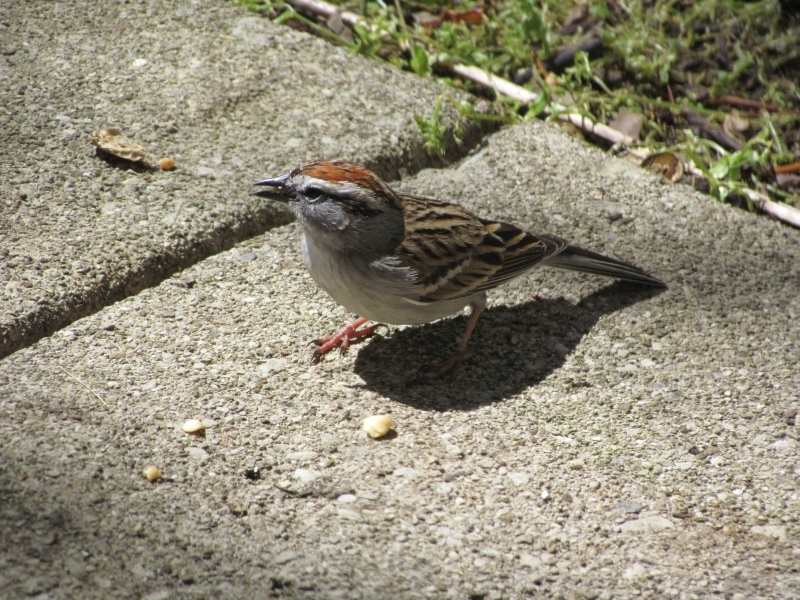 Chipping Sparrows are a favorite of mine in the neighborhood. 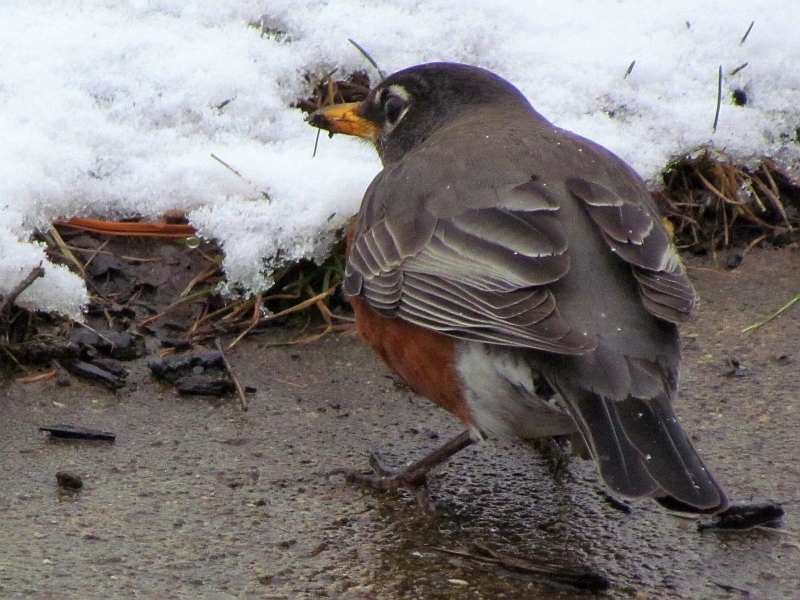 They fly south for the winter, but in the warm months they’re always around, making their pleasant chipping noises. 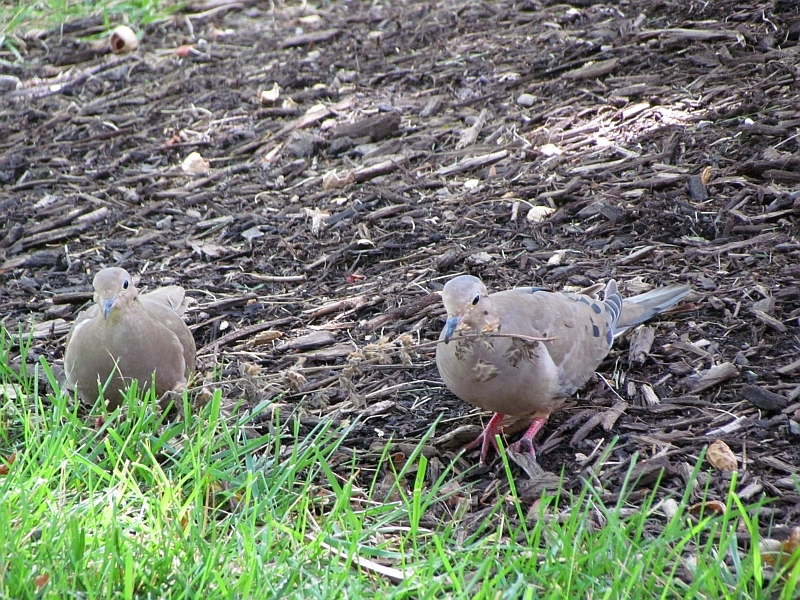 They are fairly tame and modest birds. 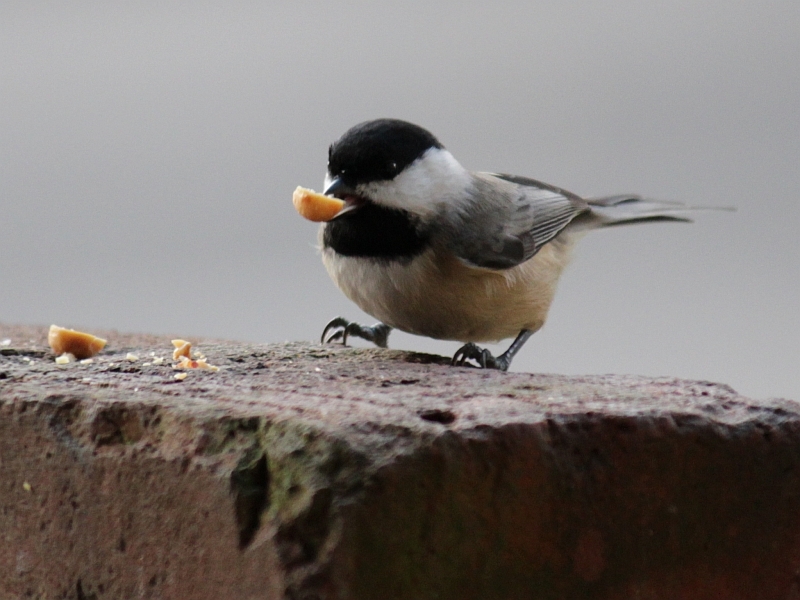 Their beaks aren’t as robust as some other birds, they’d have to work on a peanut to be able to eat it…or I’d crumble them up for them. 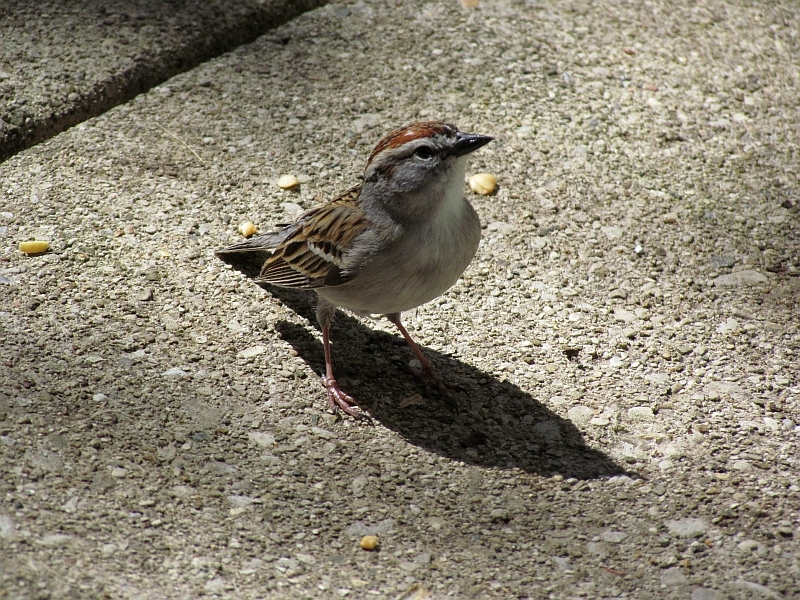 Here’s a juvenile Chipping Sparrow- they look quite different than their parents. 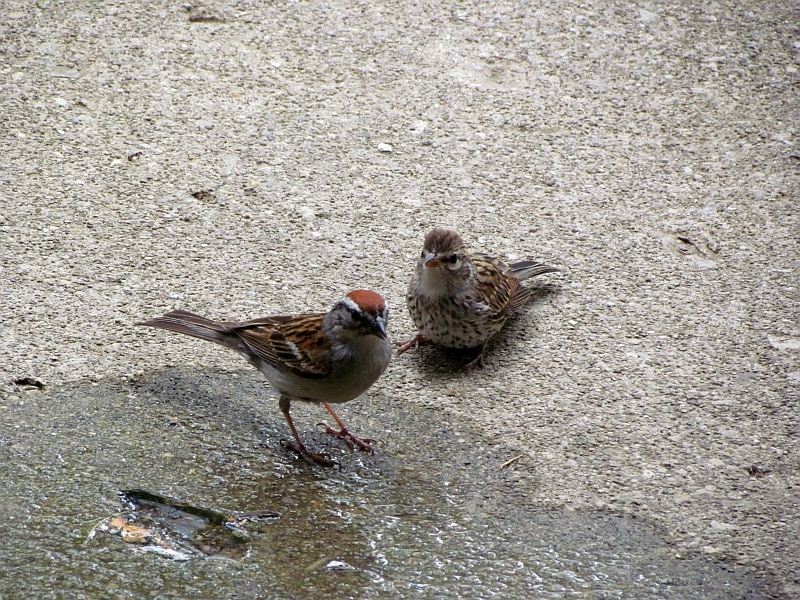 Chipping Sparrow parents take good care of their offspring. 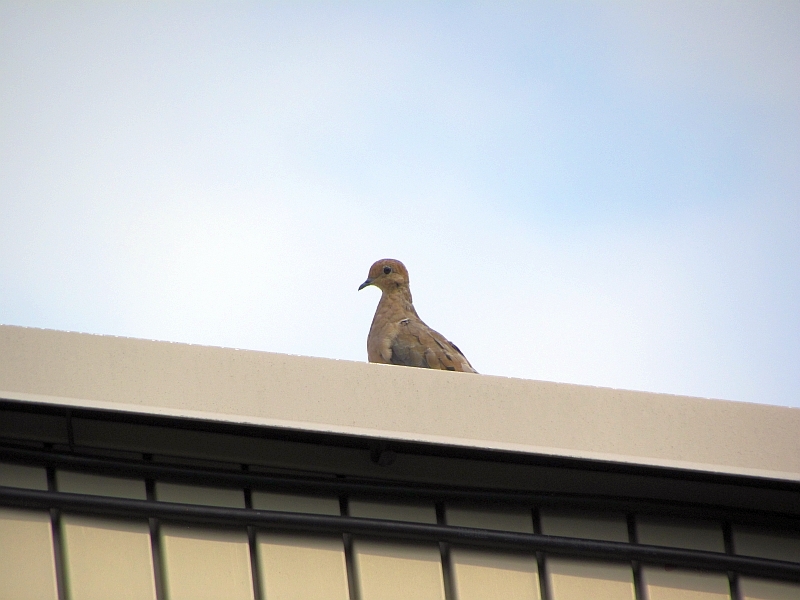 It’s always good to see and hear these birds when they return from their winter vacations. 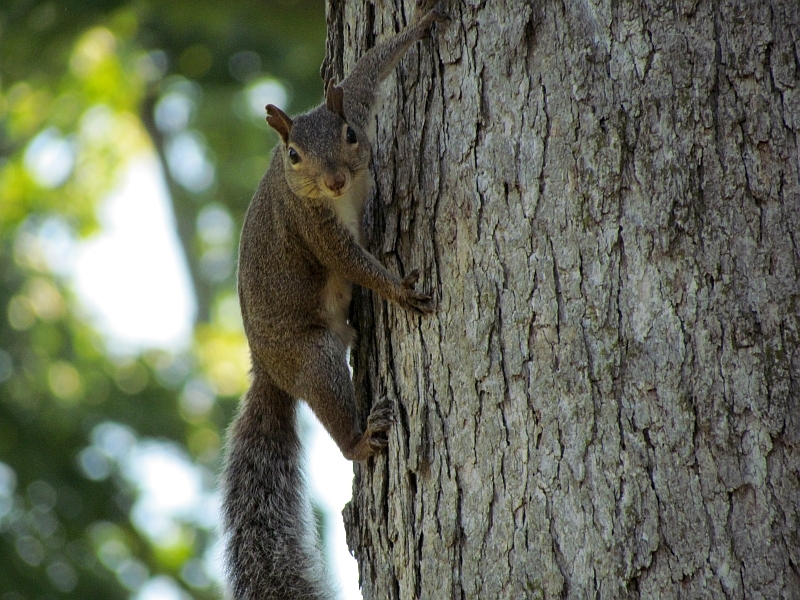 Gray Squirrels were around as usual! 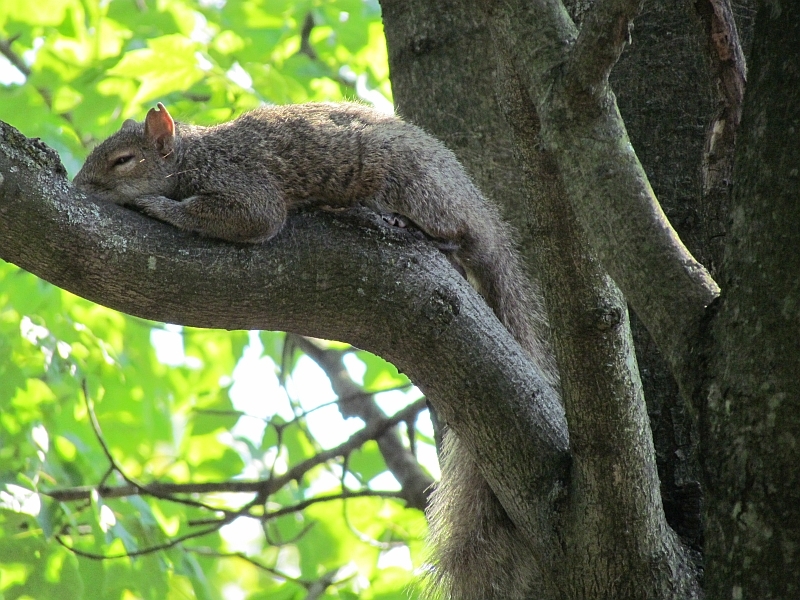 That’s one way to beat the heat! Carrying 2 peanuts at once just makes sense. But mom showed them that peanut treats are great. 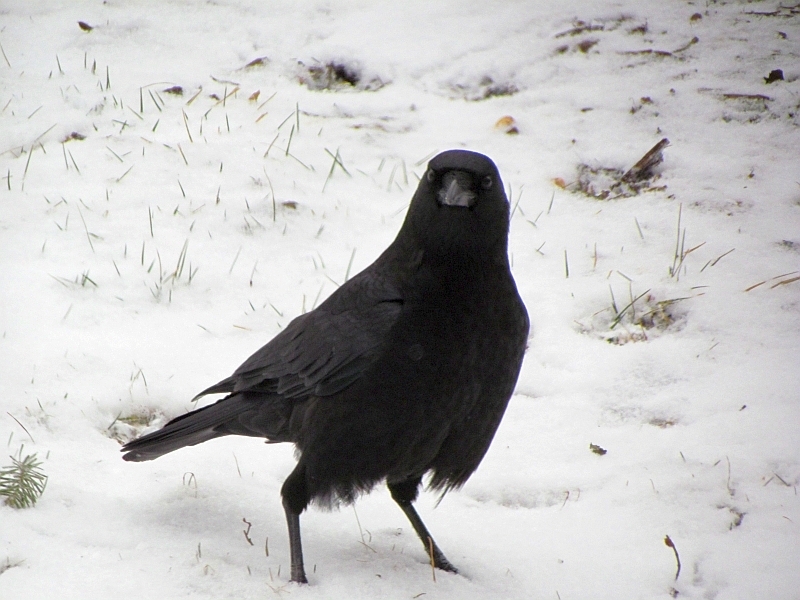 I’m a big fan of Crows- they’re very interesting creatures to watch. 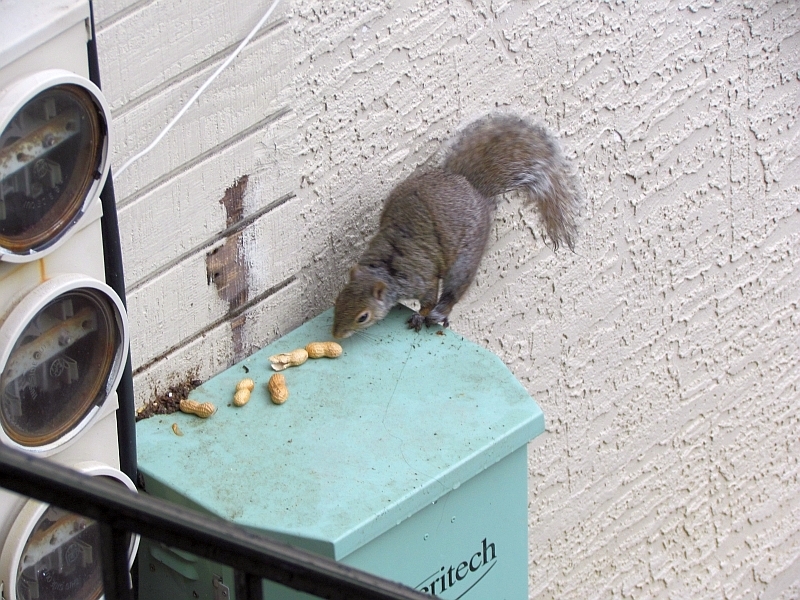 Three peanuts at once- that’s gotta be a record! 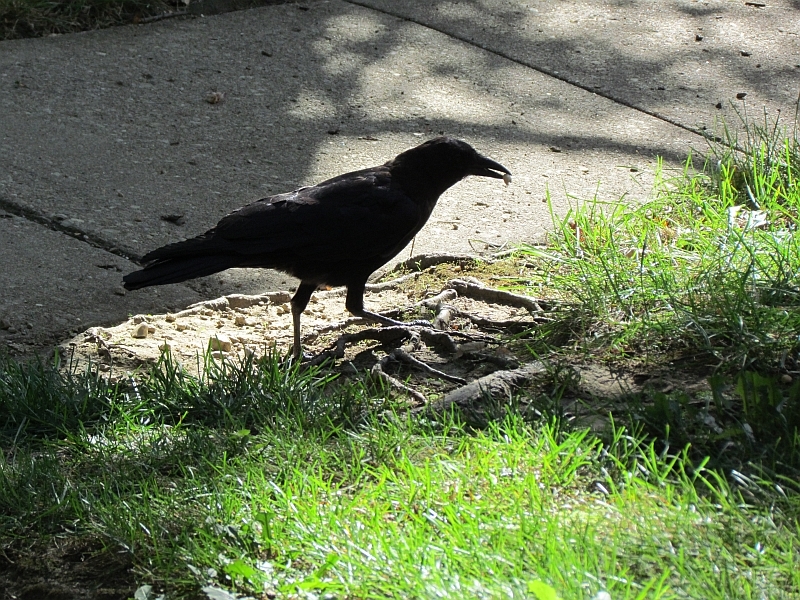 One day, 2 new Crows showed up with the family group- 2 juveniles. You can tell them by their red mouths (and the racket they made). 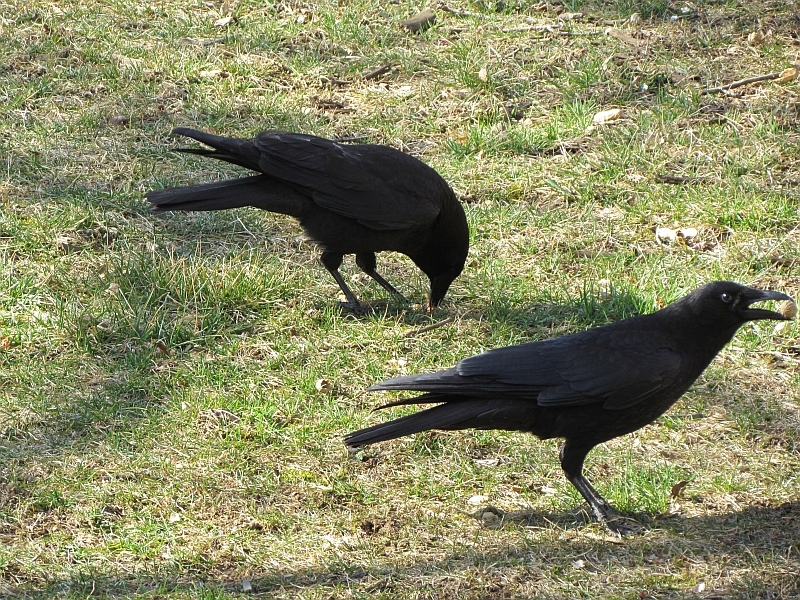 Altogether there seemed to be 6 Crows in this family group. 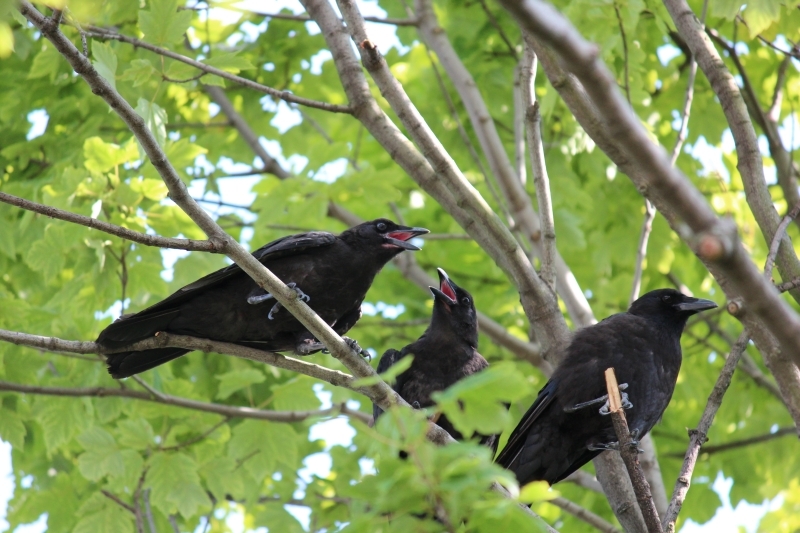 Crows will often spend their first few years with their parents to learn all of the tricks about being Crows, so it’s possible that in addition to mom and dad and the 2 new kids, there were 2 kids from previous years still hanging around. 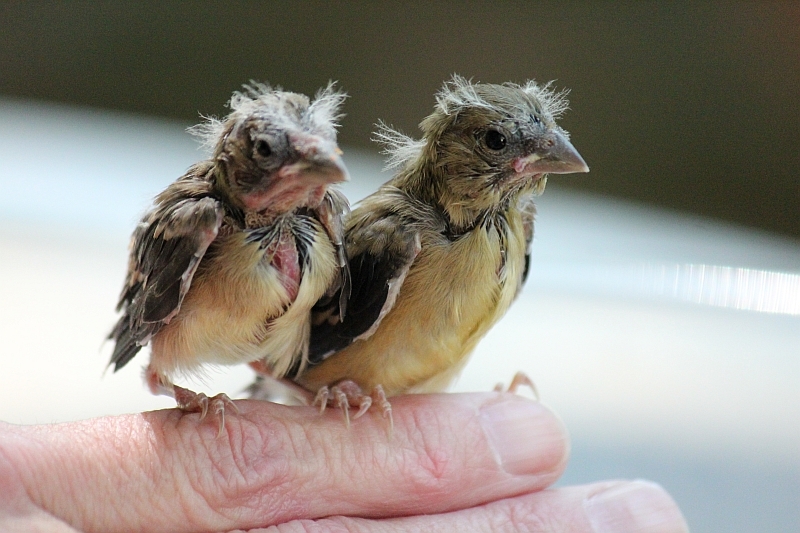 The older kids will help raise the youngest birds. 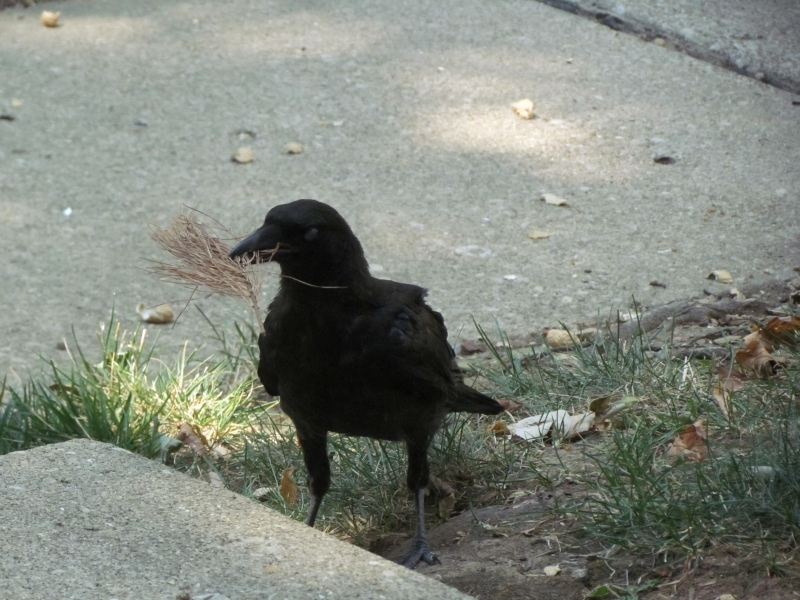 This bird is still working on what to eat…or it’s playing, or using a tool, something Crows have been known to do- they’re extremely intelligent. 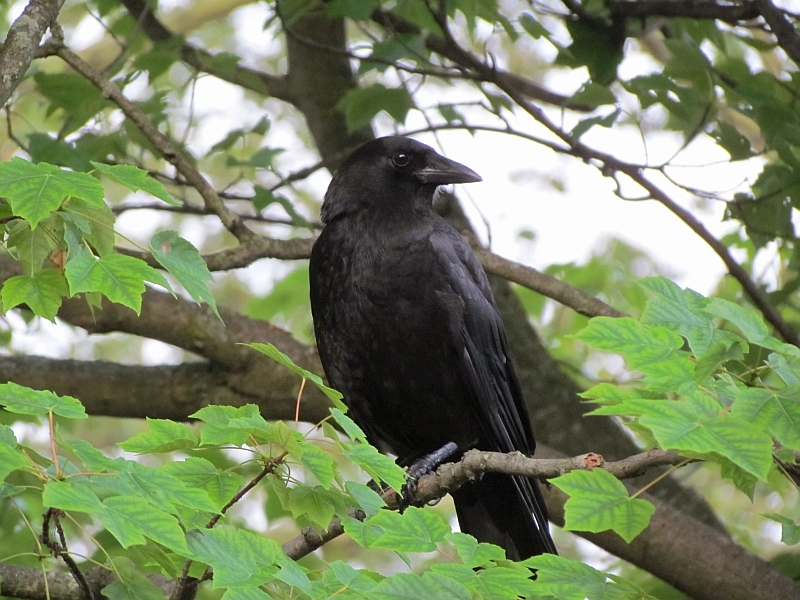 Unfortunately, in September, one of the Crow family became ill. You could see something was wrong the way it sat in trees. 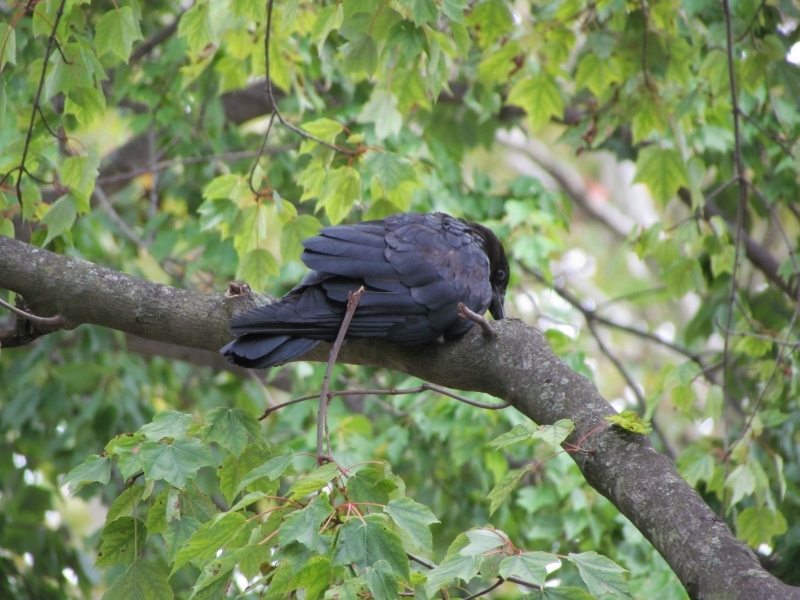 It seemed to be trying to lay its head down on branches. 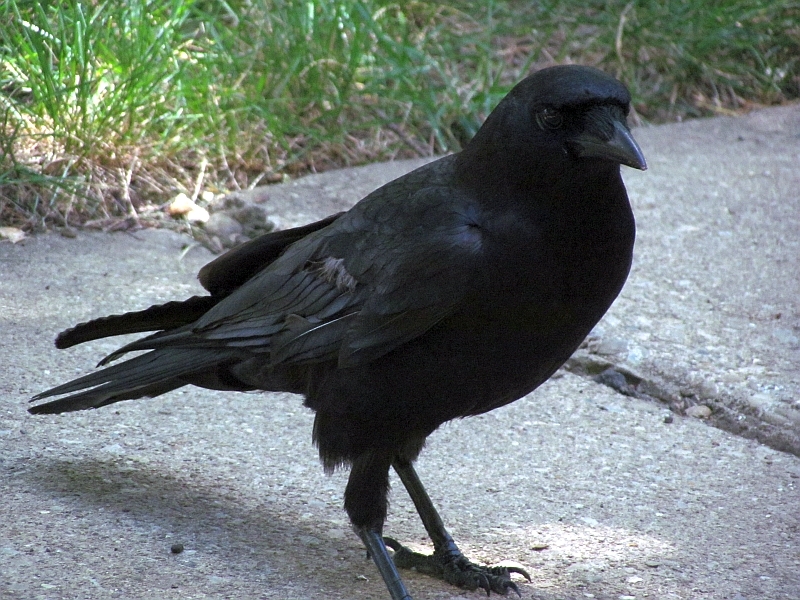 One day, this Crow couldn’t fly, and hung out on the patio. It needed help. 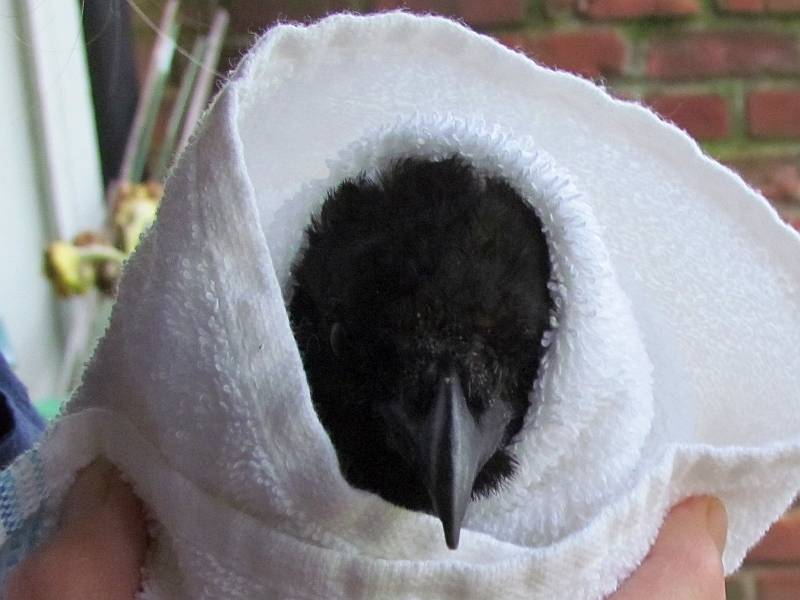 Wrapped up in a towel and ready to visit the Ohio Wildlife Center- that beak could pinch hard, but it only did that once, and was calm the rest of the time, even in the car. 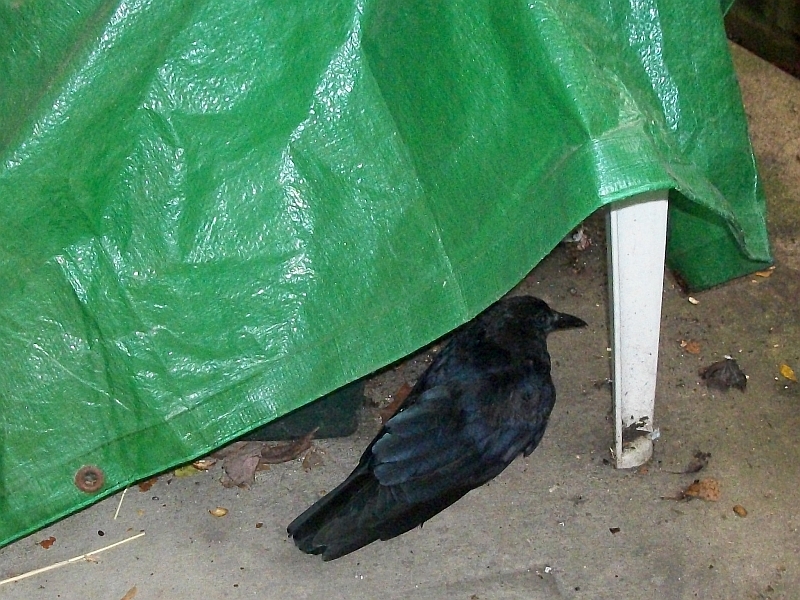 Unfortunately, after being admitted to the OWC, the Crow died 5 days later. 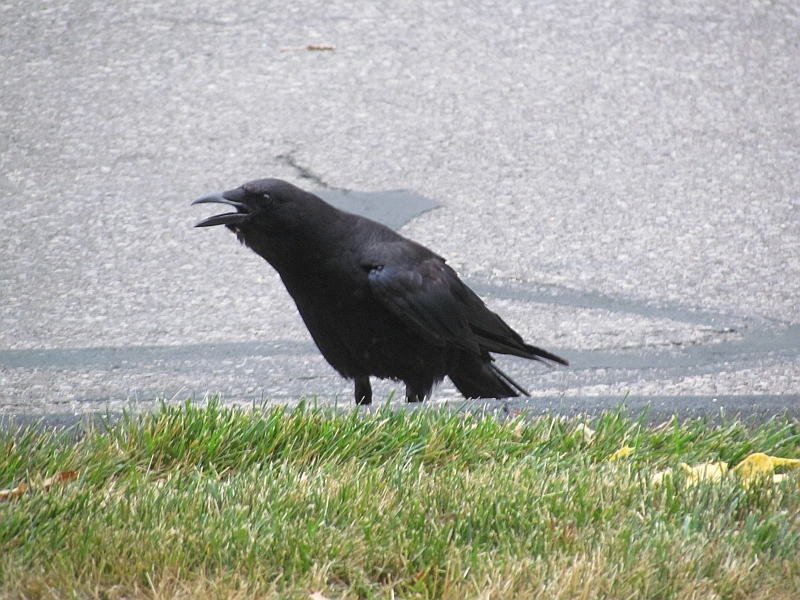 West Nile Virus was suspected- this disease hits Crows particularly hard. 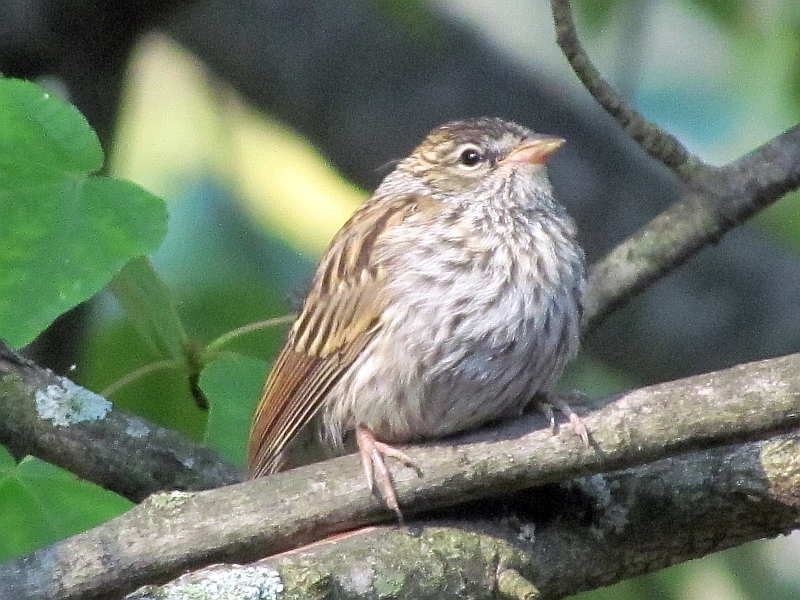 I think it was one of the younger birds. 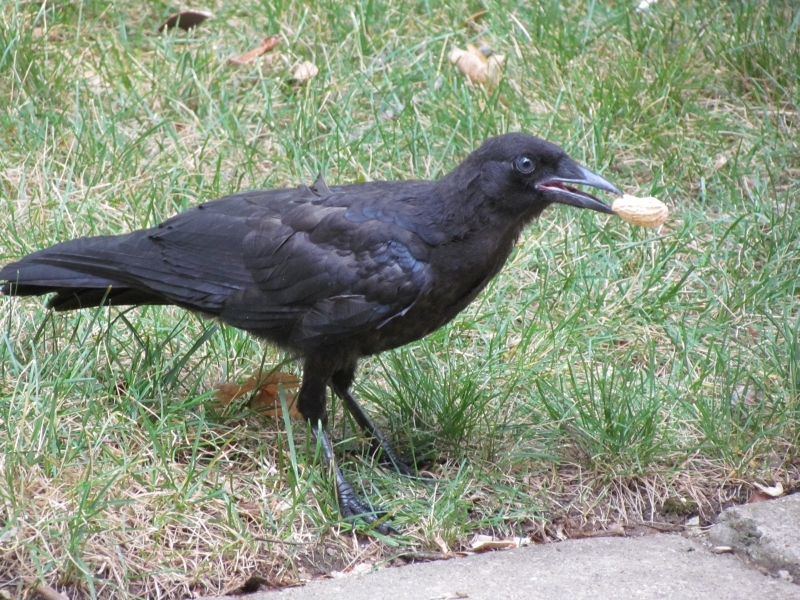 The Crow family still comes by for peanuts, often 2 at a time. 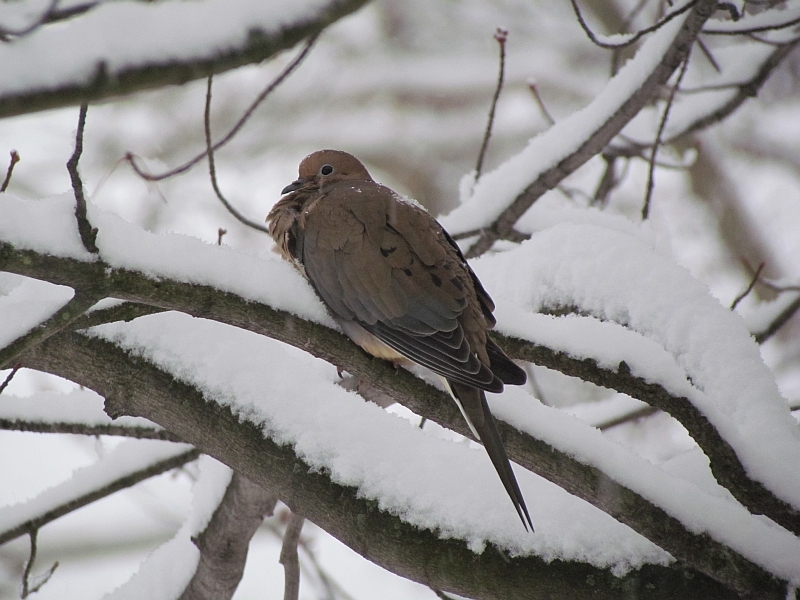 Mourning Doves come by on occasion. This pair was in a nesting mood! 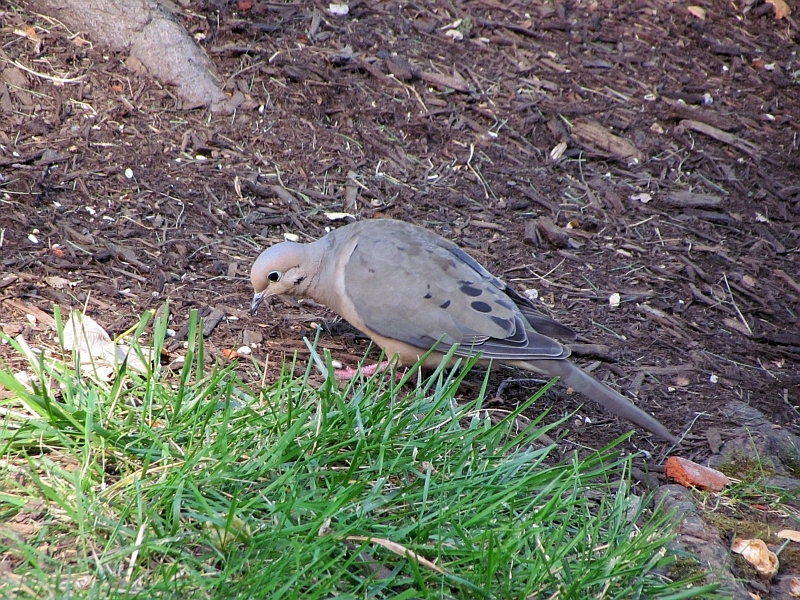 This bird has been hanging around a lot, enjoying a scattered handful of safflower seeds in the garden area. 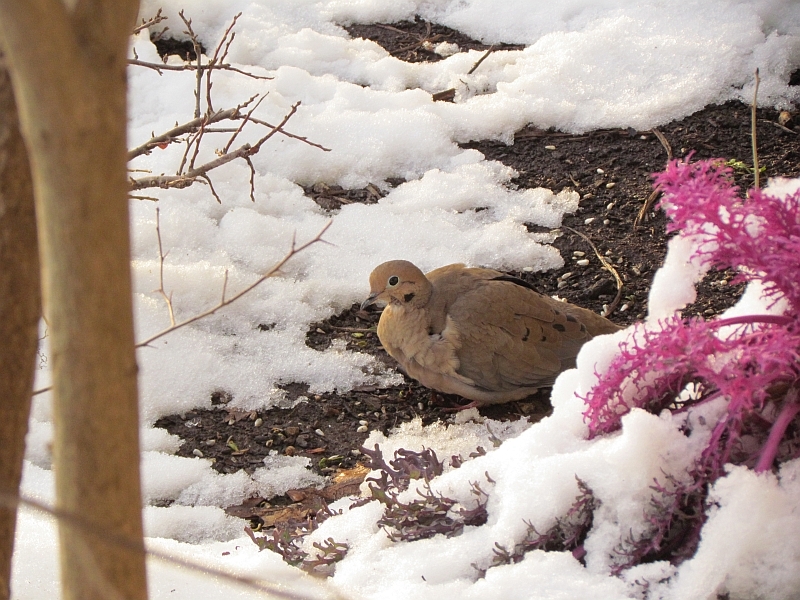 I wonder if it’s a young bird, it seems to be having a harder time than others in the winter weather. I’m keeping an eye on this one. 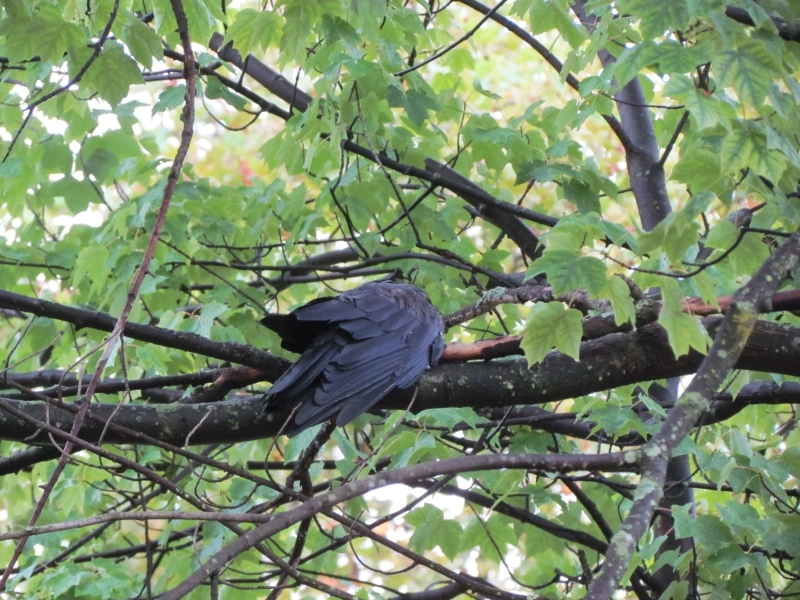 I believe it roosts in an evergreen tree across the street. 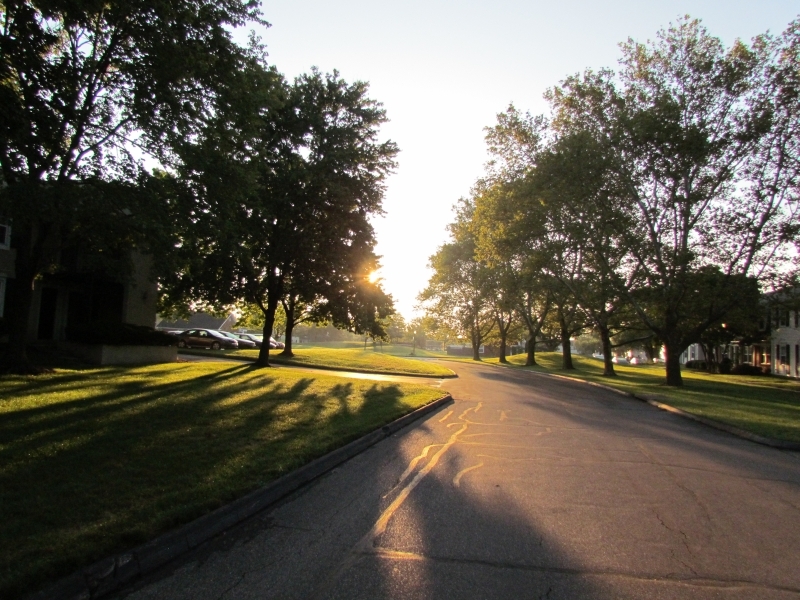 Another year has come and gone- who knows what 2013 will bring? Many thanks to all of you for reading this humble blog! 🙂 Happy Holidays! 2012 was quite the year! Let’s hope that 2013 is just as good, minus having to rescue any wildlife. The Ohio Wildlife Center is familiar with me by now 😀 Let’s hear it for a better 2013! You’re my wildlife hero. 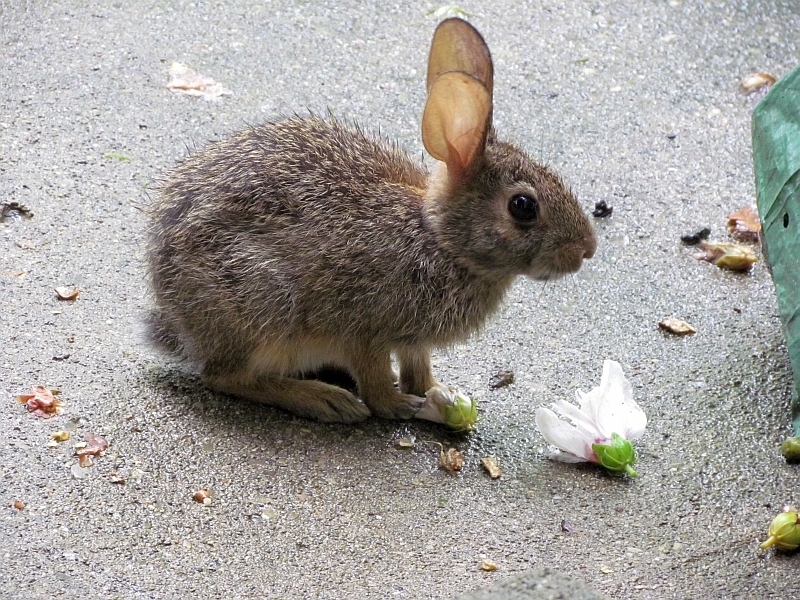 You have a wonderful heart to care so tenderly for all the creatures who visits you. I loved looking at your review photos they stirred many emotions from joy to sadness. Wishing you a Happy New Year. I look forward to another year of reading your interesting narratives and seeing your gorgeous photos. Many thanks and Happy New Year E.C.! 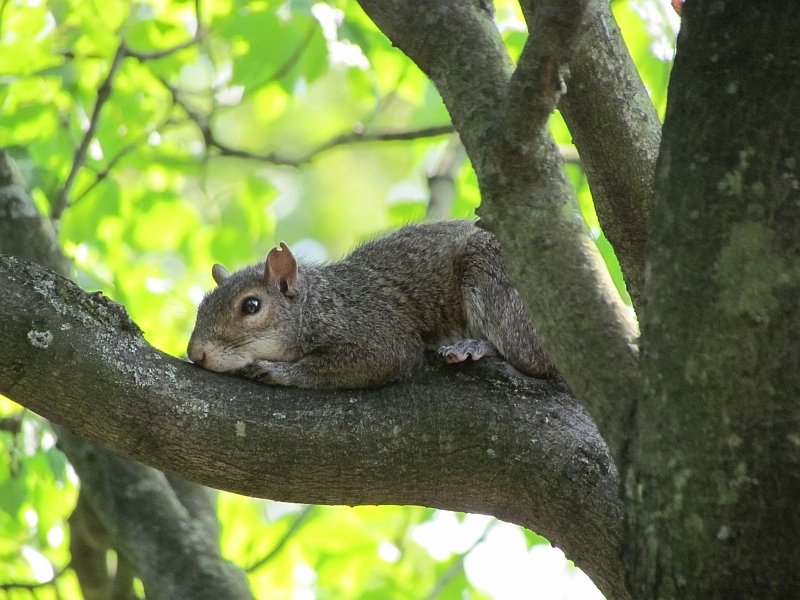 It’s a good thing to have a place like the Ohio Wildlife Center in town, they do great work- they literally take in thousands of injured or helpless animals a year and do their best to restore their health and then release them into the wild once more. I make sure that they get a donation with each visit. Great year! 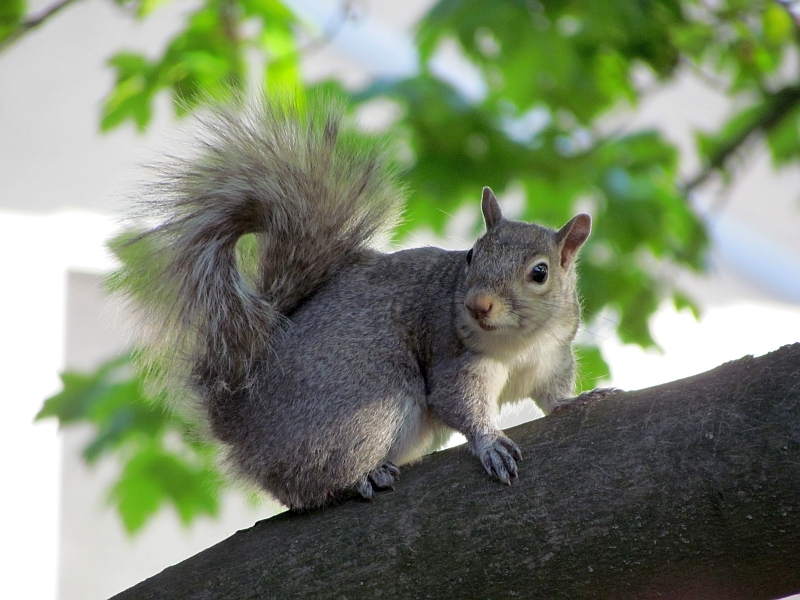 It’s amazing how much joy these little creatures bring us! All great pictures. 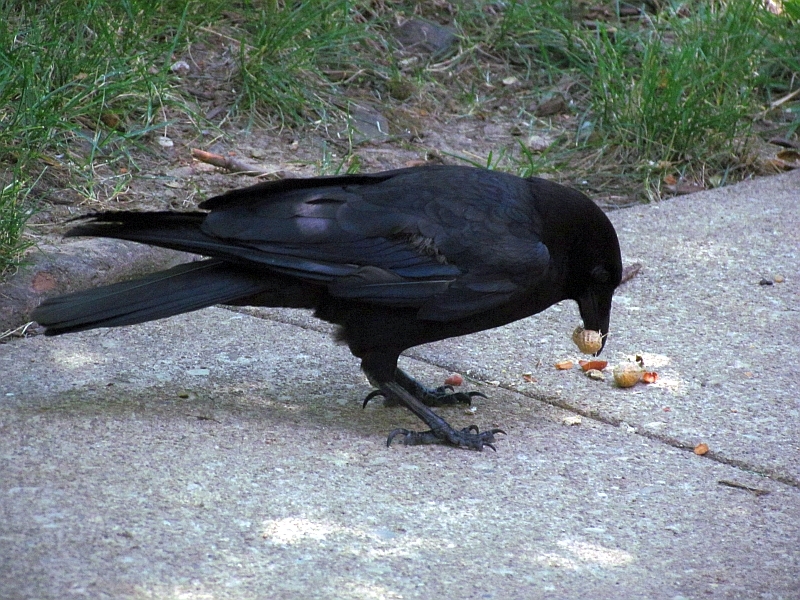 I also think crows are interesting birds – they have a highly developed social hierarchy. 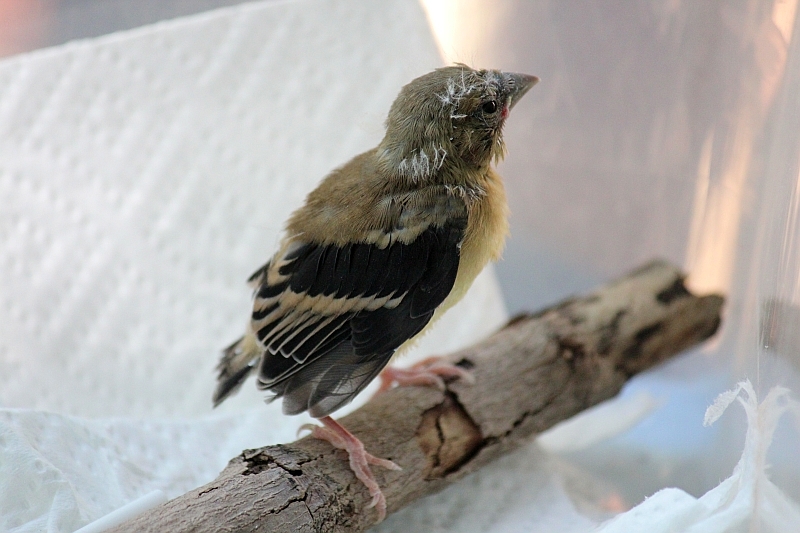 I rescued an injured Bluebird last summer and took it to a rescue center in Virginia. 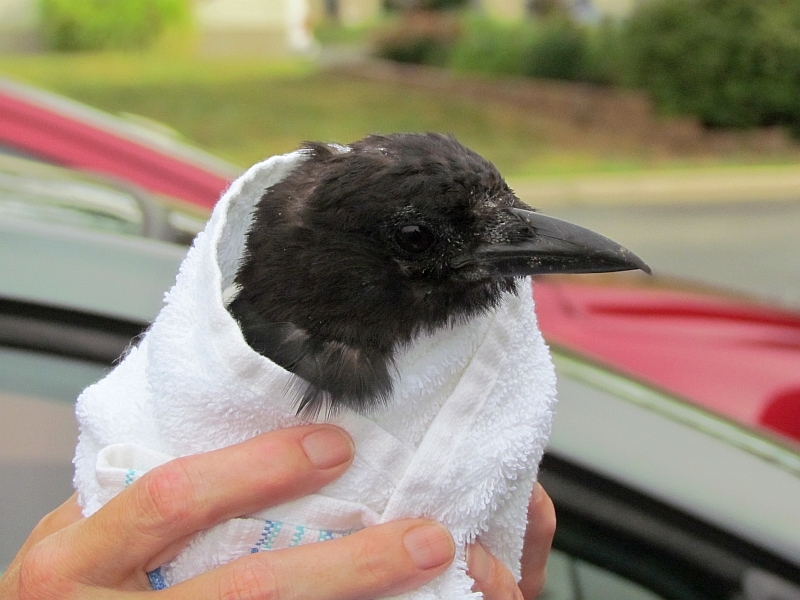 They had to put it down because his broken wing couldn’t be mended. 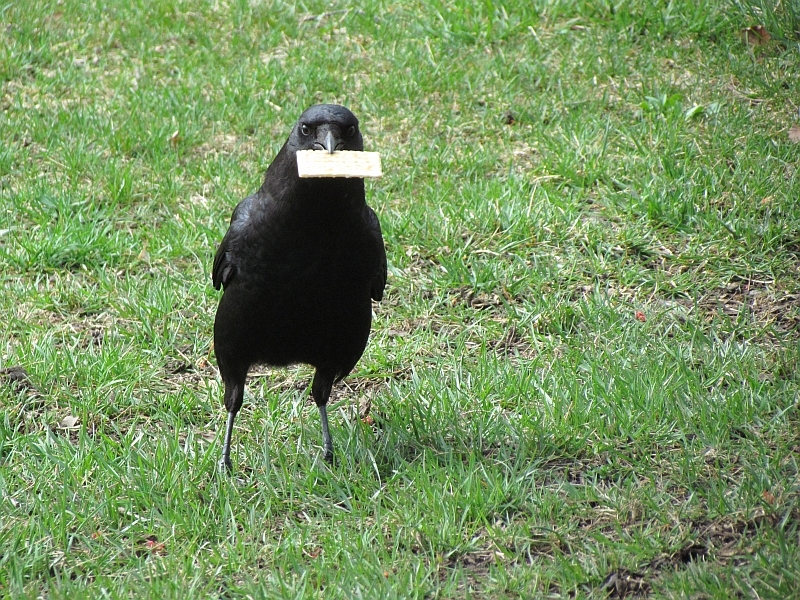 The Crows are indeed very social. Another interesting activity they do is the occasional mobbing of hawks to drive them away, I believe they did this early this morning (and woke me up with their terrific cawing). Sorry to hear about the Bluebird, there are many Bluebird nesting boxes here in the parks, and Bluebirds can frequently be seen around them. 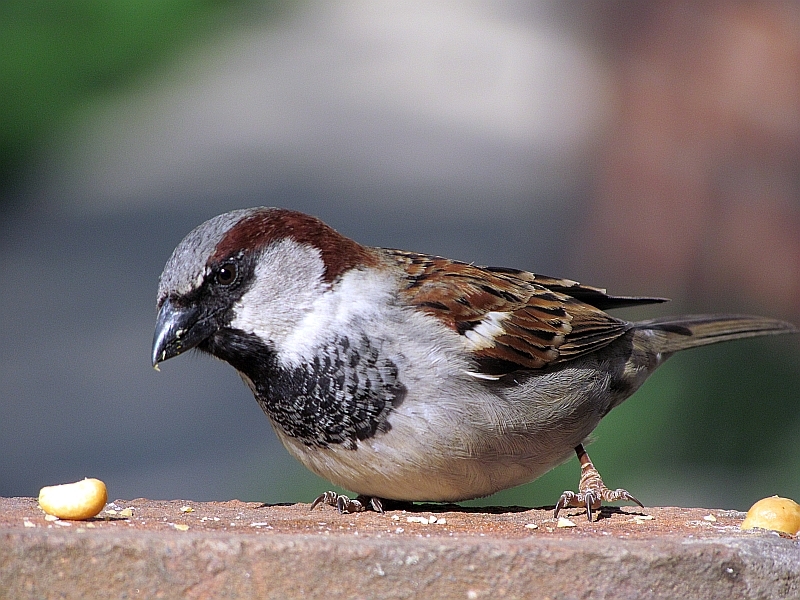 Very nice birds! A full year, no wonder it went so fast. Beautiful shots of all the wonderful visitors you have. Your photos were great fun to look through. 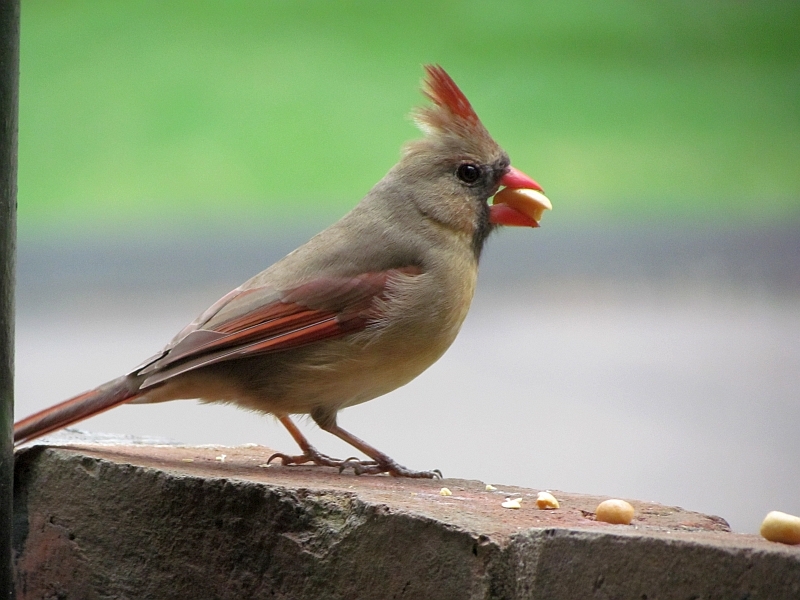 We have a lot of peanut eating birds here, too. The record for peanut taking was a blue jay. 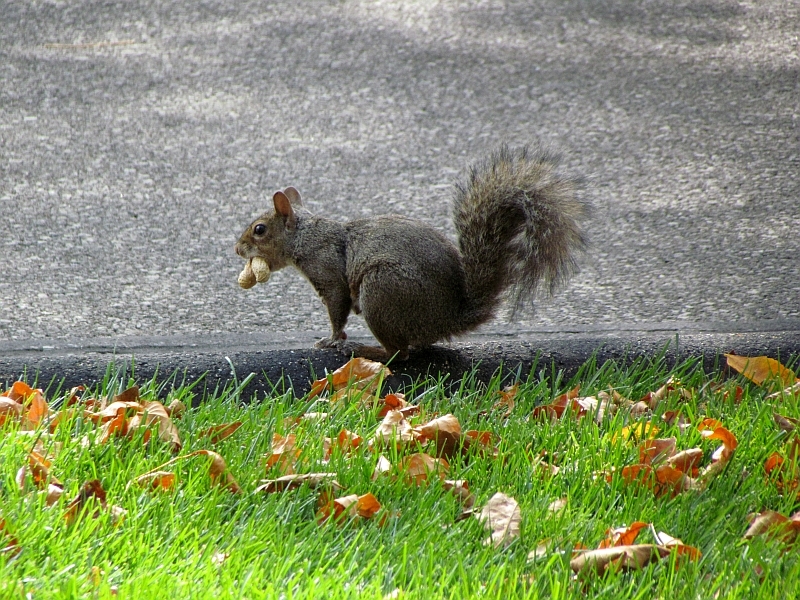 He had one (In the shell) in his mouth and grabbed another. 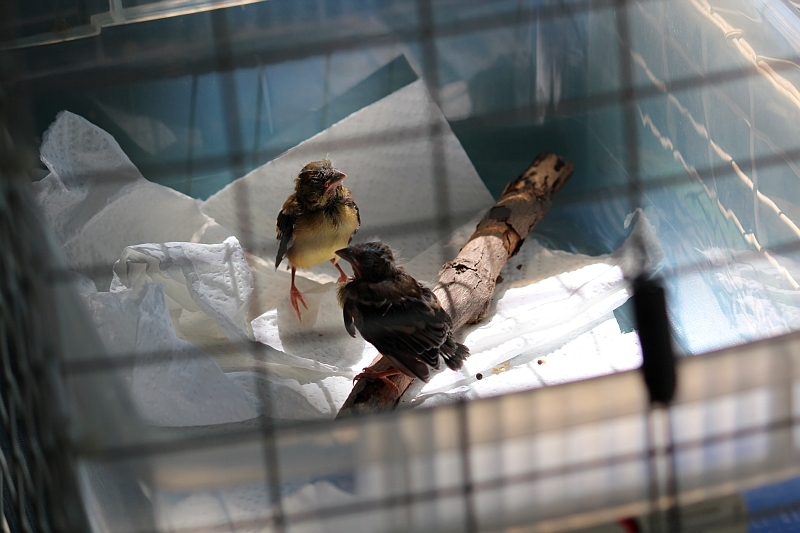 I was happy to see the Goldfinches were cared for and sad about the Crow. 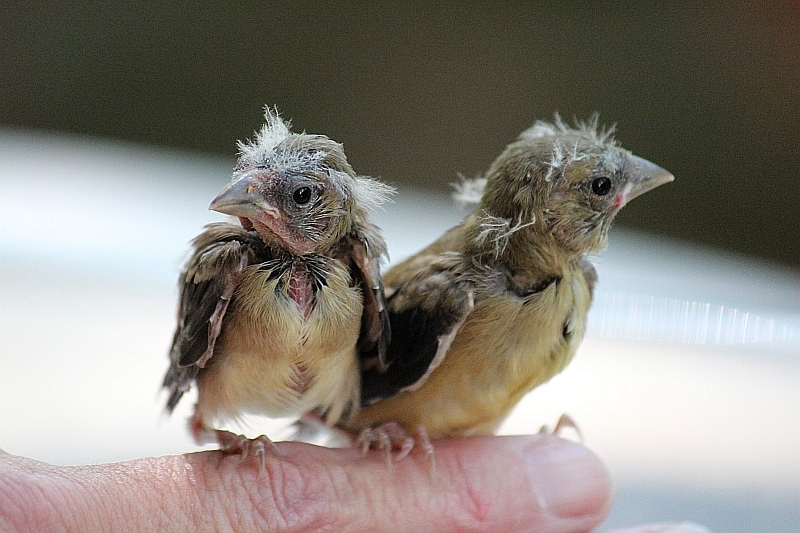 I would really like to be able to take care of birds like that, but I looked at the government paperwork… oh my. Thanks Birding Bunch! 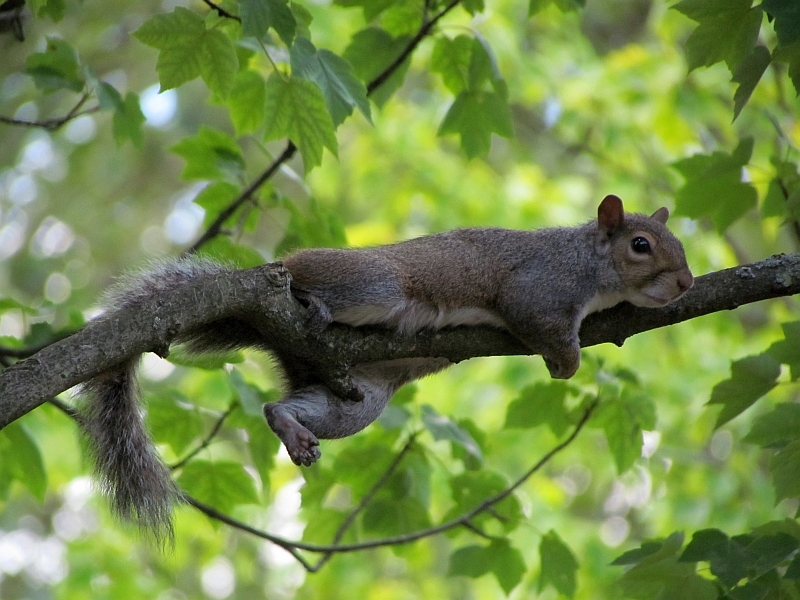 The Ohio Wildlife Center knows what they are doing to care for all of the creatures they see, and they’re licensed to do that as well, which is important in this day and age of all of those regulations on the books. They have around-the-clock volunteers which provide constant care, too. The Peanut Gallery is a great tradition! Always look forward to your posts, thanks for another wonderful year! Many thanks for reading, John! 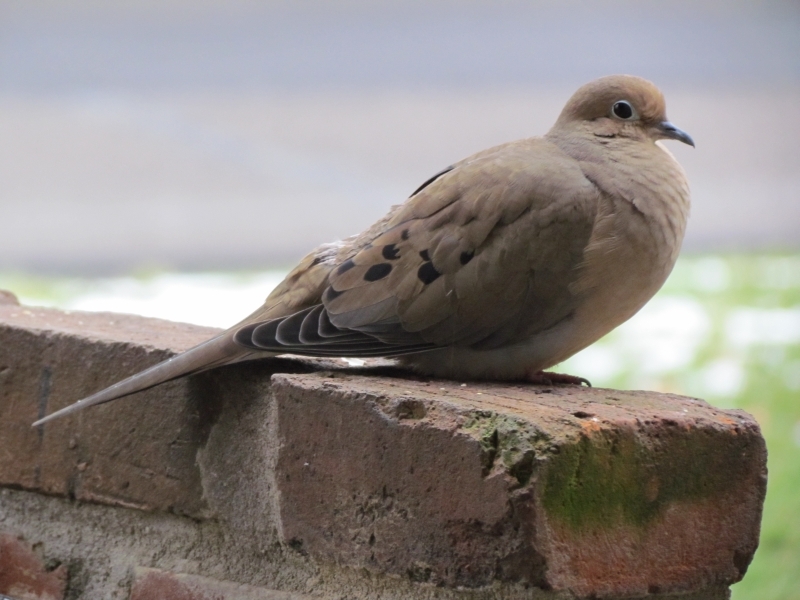 I try to get enough pictures of my feathered and furry neighbors each year with this end-of-the-year post in mind! What a year! Love your bunny. 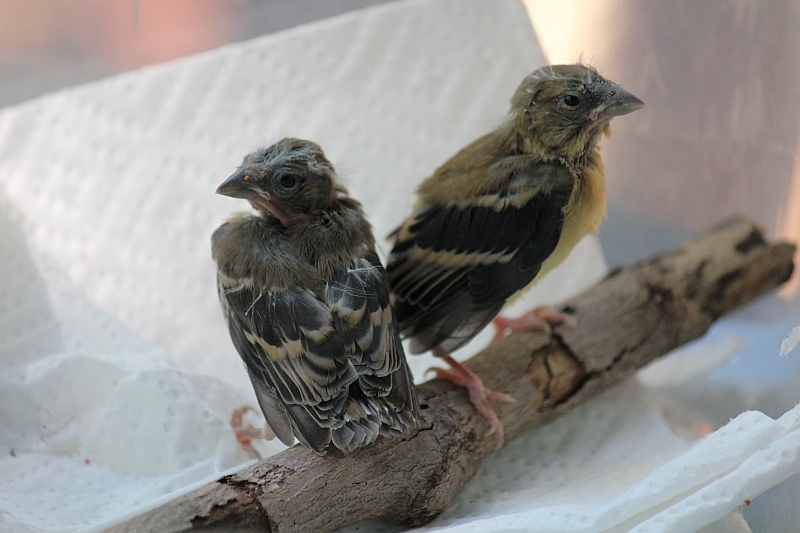 I’ve never seen such young goldfinches. Thanks for taking care of them and giving them a chance. 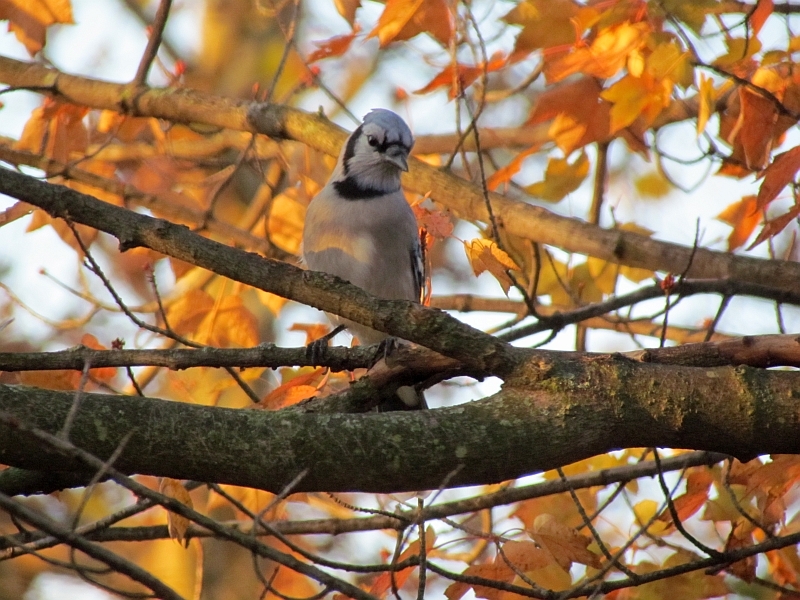 It’s easy to become attached to them; the blue jays are good at training humans. 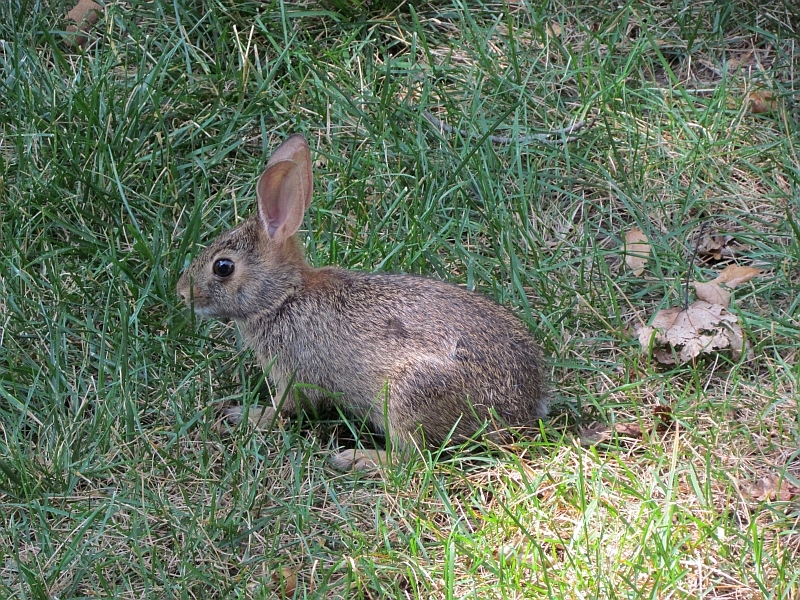 That little bunny was very photogenic. 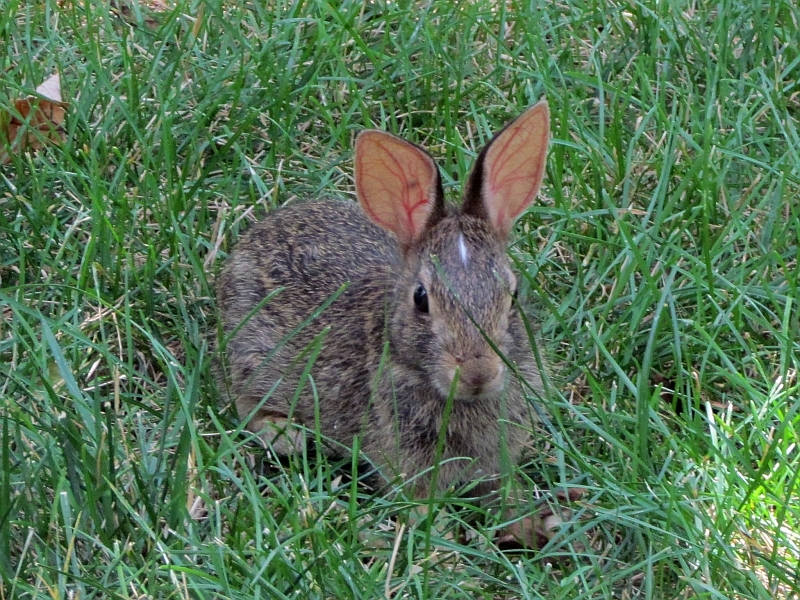 There are a few rabbits that live here on the apartment complex, and funny enough, one of the local cats sits out on the lawn with them- wish I had a picture of that! This particular cat is not aggressive at all towards them, and they know it and will lounge around the area with the cat! 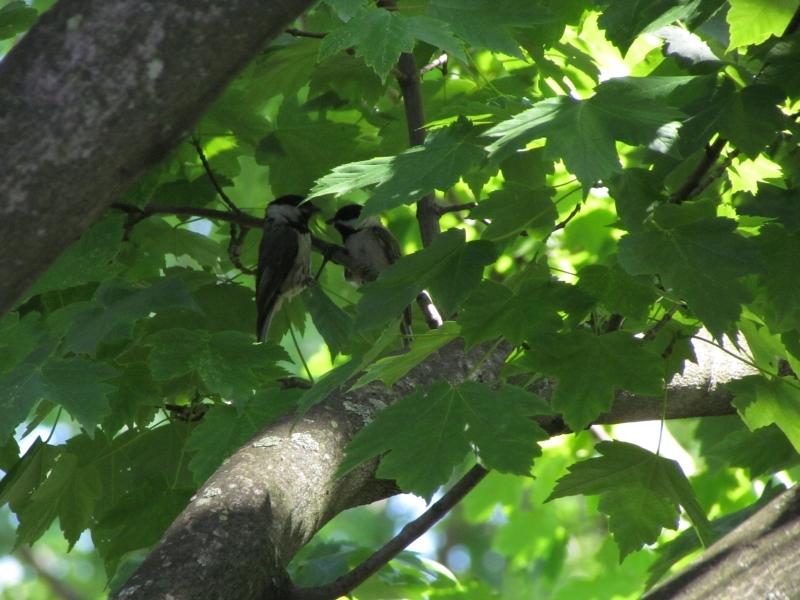 I was hoping the Goldfinch nestlings could be reunited with their mom, but the hawk was literally sitting in nearby trees waiting for a chance to get them. 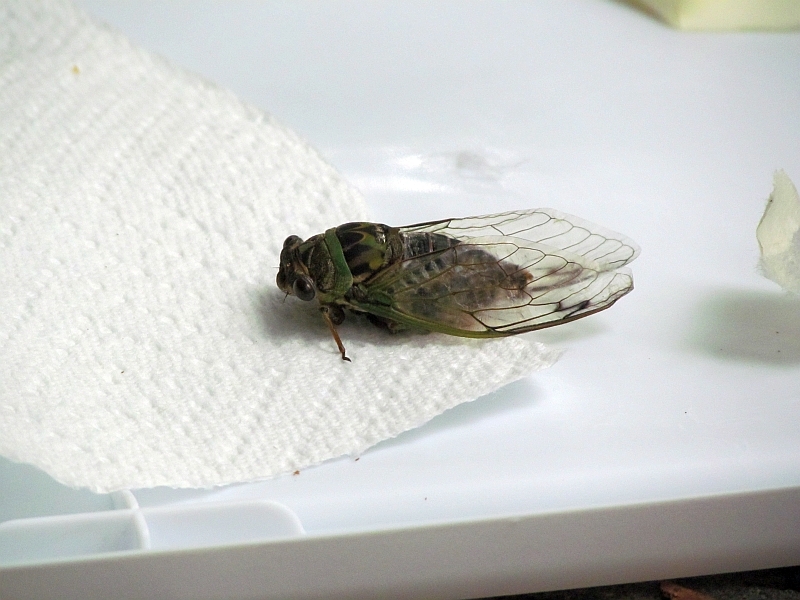 I just missed a good picture of it, but it took off when I focused the camera on it. 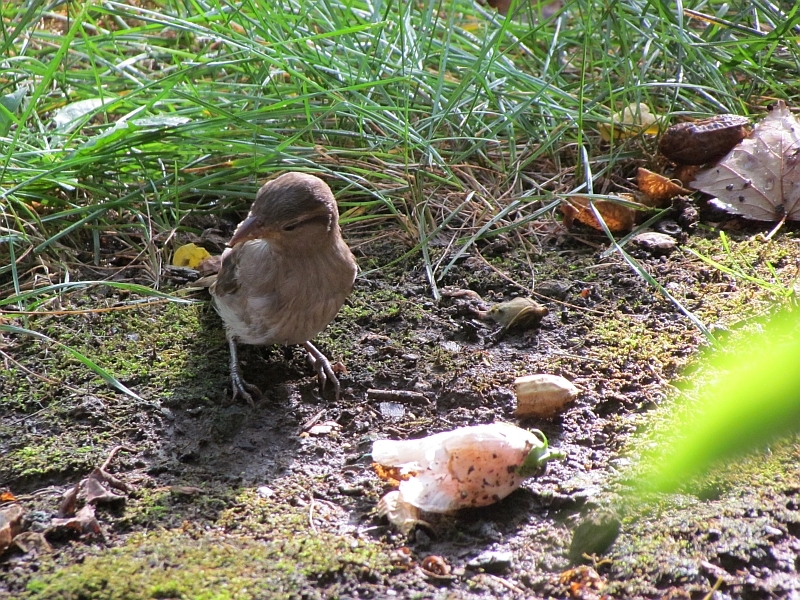 Nothing against hawks, they have to eat too, but not those nestlings! I really enjoyed seeing these pictures. Thanks montucky! 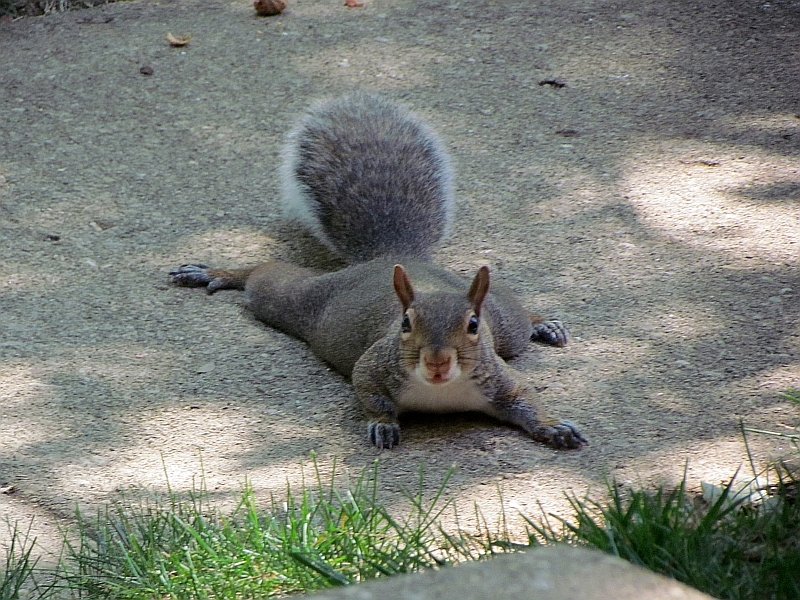 I always enjoy visiting your blog with its fantastic photos! These were excellent pictures. 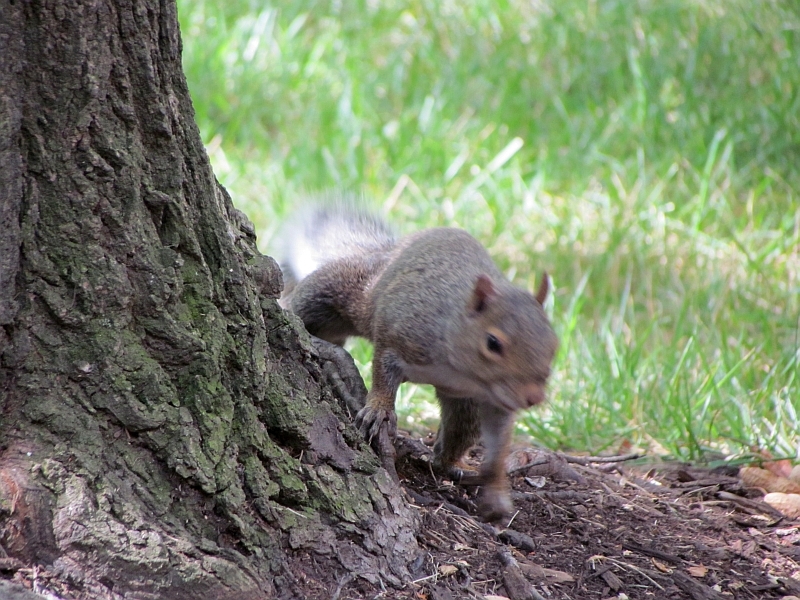 I’m glad the local wildlife has a friend. Thanks! It’s striking how nature is in force right outside one’s door. Happy New Year Margie! 🙂 Many thanks! Thank you Lynn- here’s to another avian year! What an incredible collection of photos! I enjoyed them very much. Thank you for being a friend to the little animals! Looking forward to more in 2013! Happy New Year, Tracy! Many thanks, Karen! Happy New Year! There are some really great shots here! Thanks for sharing the collection and Happy New Year! Thanks and Happy New Year Jen!